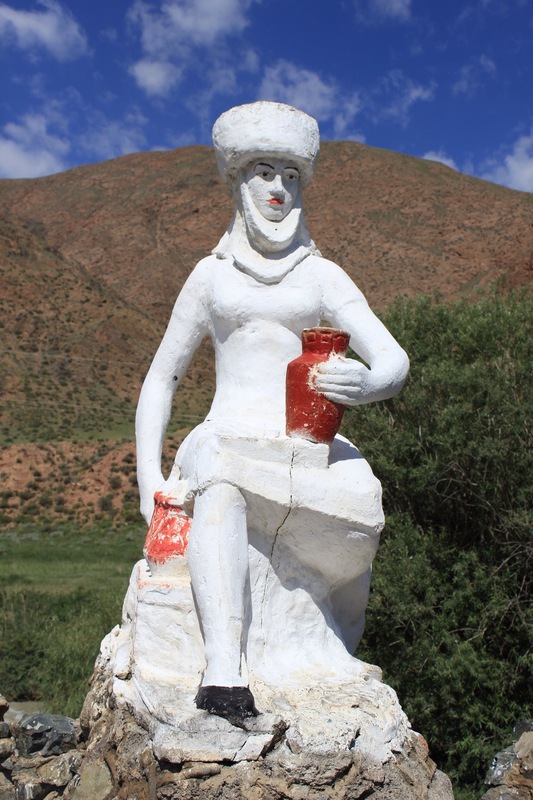 TAJIKISTAN and the start of The Pamirs!!! 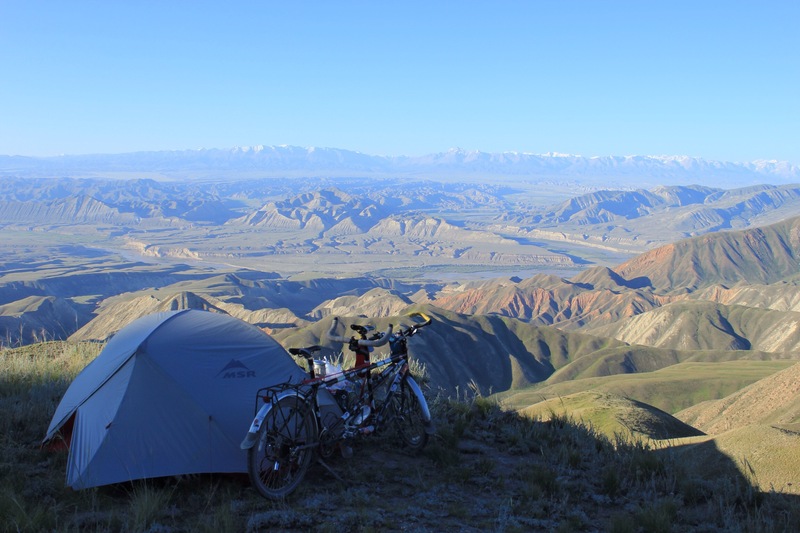 We stayed in Sary-Tash for our final night in Kyrgysztan. To our pleasant surprise Leonie and Peter, a lovely Dutch couple who are traveling by motorbike and who we met briefly on the road from Song-Kol Lake, arrived at our guesthouse late in the afternoon and we spent a pleasant evening with them over dinner in our guesthouse. 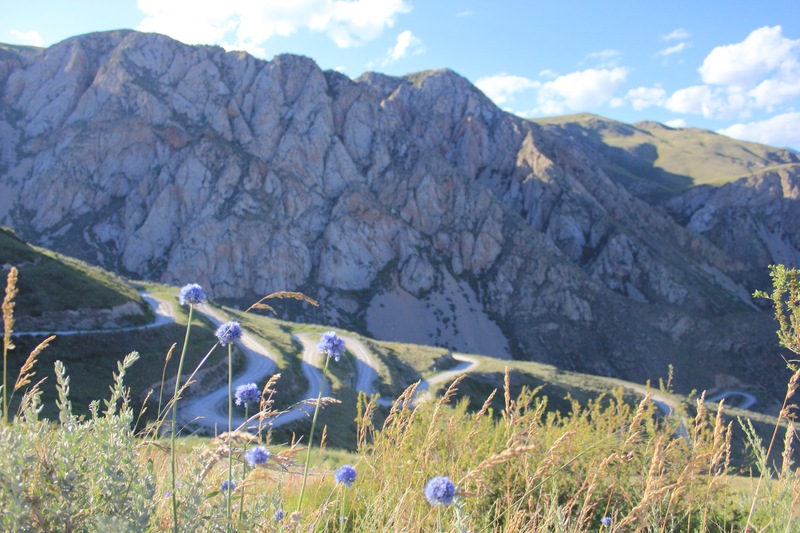 The next morning wasn’t a particularly early start, a mistake perhaps in light of what lay ahead – a significant climb up to the Tajik border post. 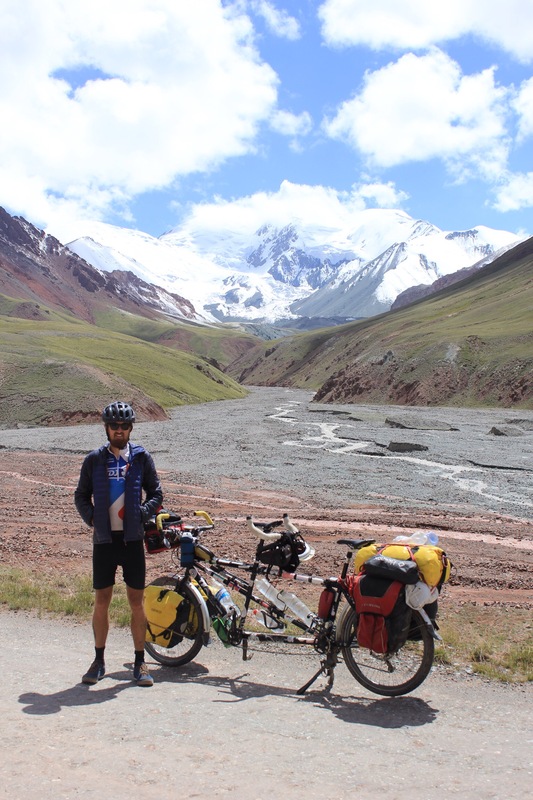 From there we would wind our way down to Karakol, climb back up to complete what is the highest peak of the Pamir, before finally reaching Murghab. 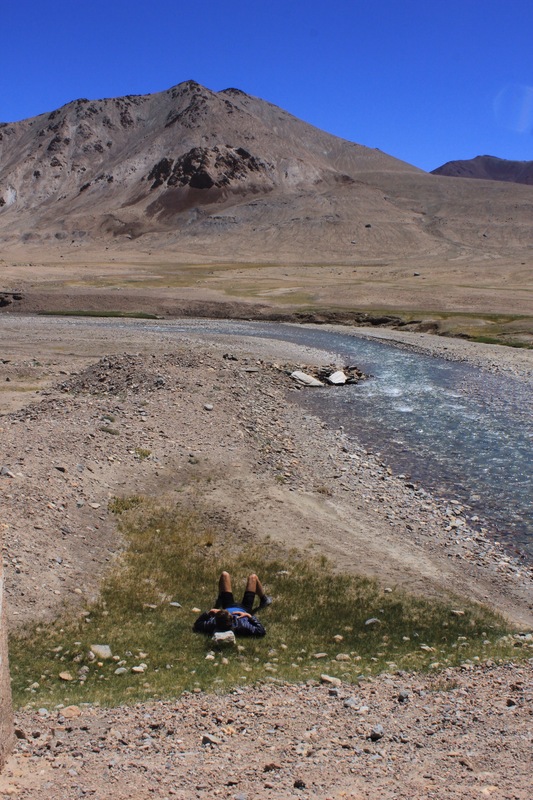 We were banking on reaching Murghab in 3 days where we would enjoy a rest day before continuing on down towards the Wakhan valley. It would end up being a gruelling three days…. A cruel headwind greeted us as we set out that morning and it got colder as we gradually climbed up. By lunchtime we had left the asphalt behind us and had already been forced to push the tandem barefoot through a river due to a collapsed bridge. The prospect of reaching country no.7 that evening was keeping us both happy however and the scenery was pretty nice too. 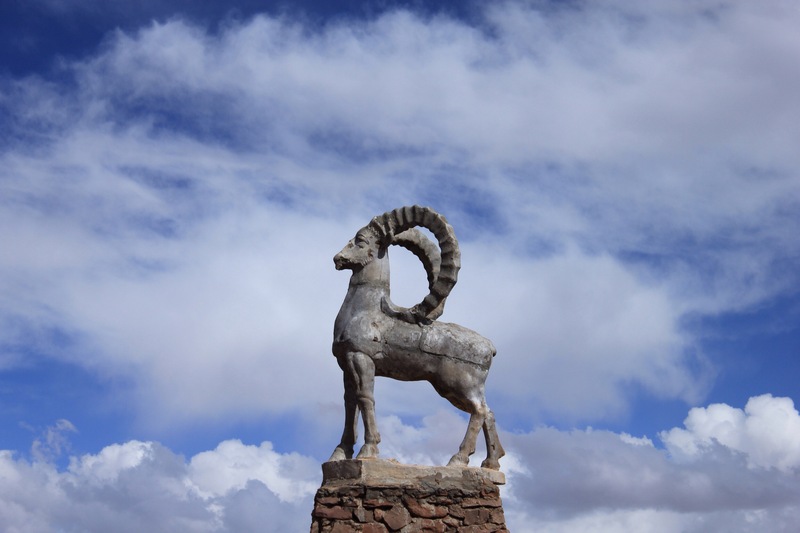 We reached the Kyrgyz border post where a nice guard stamps us out, checks we’re OK with the oncoming altitude and reminds us to look out for the famous Marco Polo sheep. 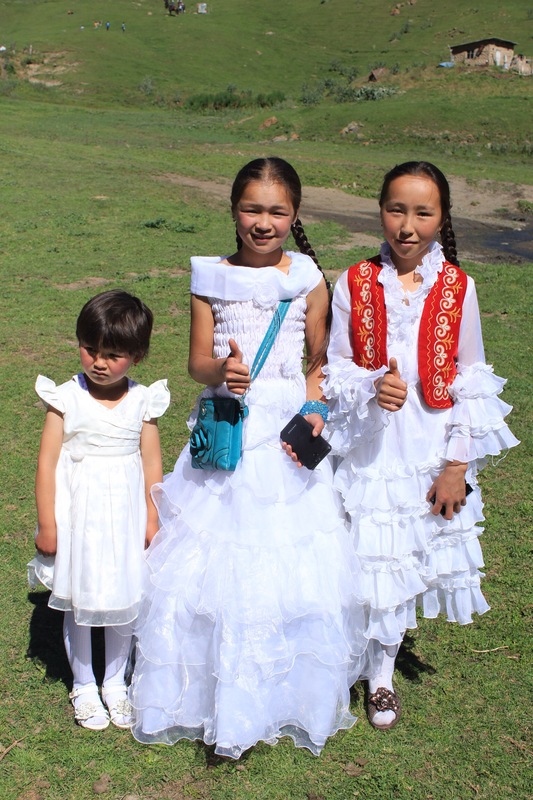 We’ll miss this kind of friendliness – bye bye Kyrgyzstan! 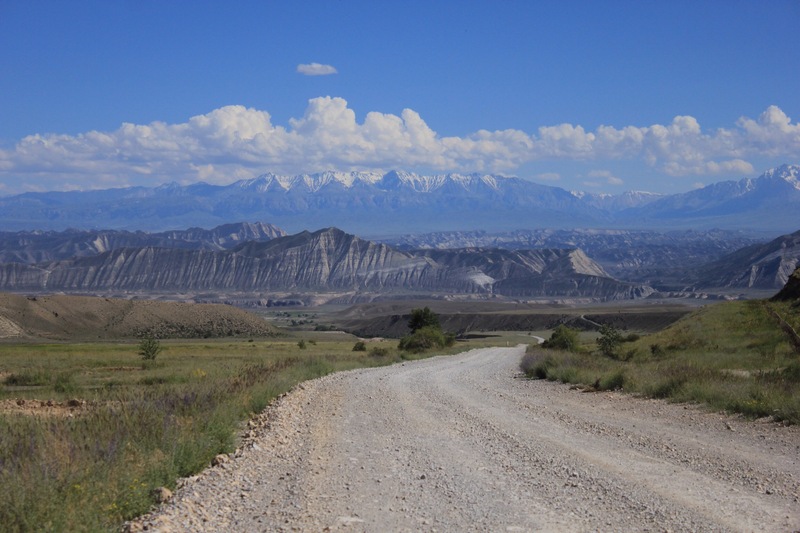 A 20km stretch of no mans land was now ahead of us before we would reach Tajikistan. Just before the beginning of the pass proper we meet a bunch of cyclists coming the other way who warn us of a muddy and snowy climb. As it happened, more from luck than good planning, we reach the top late in the afternoon when most of the mud had dried in the sun. Nevertheless it was a hard climb complete with some stiff switchback at the end and we were greeted by a howling wind at the top. A weather front closed in behind us and we wouldn’t be surprised if it had snowed again on that side of the pass that night. We reach the Tajik post at 6pm (apparently it is open 24 hours) and are away again by 6:15. Not wanting to go much further, we set up camp just a few kilometres down from the border post, managing to hide from most of the wind by pitching our tent in a sheltered dip. It’s pretty desolate and dessert like up here and we huddle together in the tent while a thin layer of sand settles on our sleeping bag. An early and very cold start – our water bottles were half frozen! 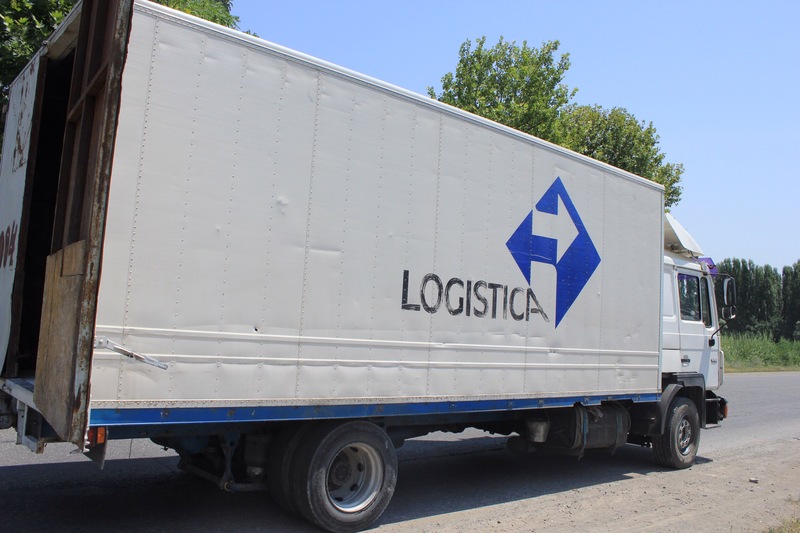 We shake the sand out of everything before packing up and we’re soon back on the road which turns back into asphalt. A few minor climbs but the overall outlook is downhill. After the last pass we catch our first glimpses of Karakol Lake and can spot the small town perched on the shore on the opposite side. Its very beautiful and we spend some time lapping up the view. We meet a friendly Russian cyclist who hands over a sticker of his own design for our bike. He points out Paddy’s Robbie Keene sticker and asks why I don’t have one of Gareth Bale! Wales’ recent success in the football has certainly put my little country on the international map! 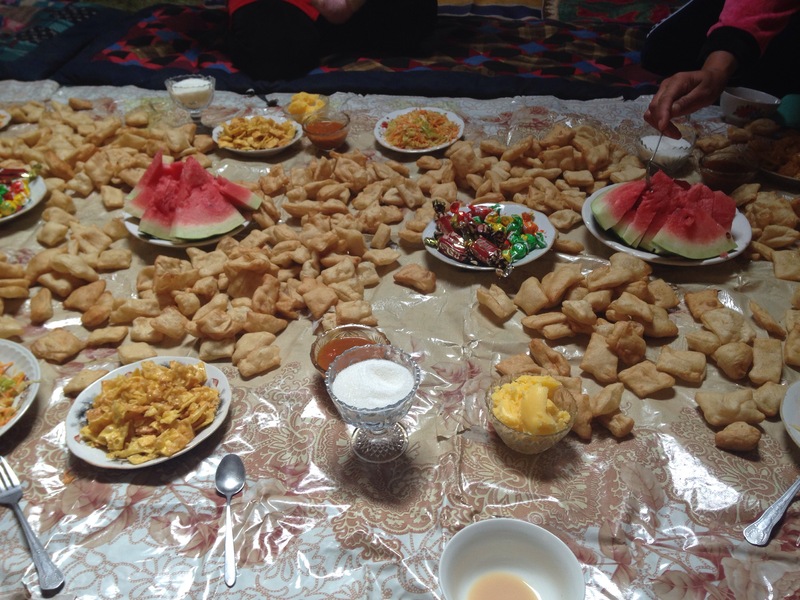 We stop at a friendly homestay for lunch who also exchange the remainder of our Kyrgyz com into Tajik somoni, and then battle with a very strong side wind as we skirt around the lake. After a frustratingly sleepless night we are both feeling in tatters the next morning. I’m marginally better than Paddy so pack up the tent while he slumps in a chair. It’s incredibly dusty and all our stuff is covered in the same grey filth. We get on the bike without cooking breakfast, neither of us can stomach eating. We’re both desperate to reach Murghab but with 105km and a very tough climb ahead, neither of us could see how we were going to make it. All we wanted was a bed!! Fortunately as soon as we’re on the bike we both start to feel a little better. It’s a stunning morning, the road is good and we cycle through a vast open valley, the morning sun pouring down on a beautiful mountain range to our left. Here we stock up on water and pass some abandoned farm buildings and houses. A short while later the road, to our dismay, turns back into a stony, sandy, washboard mess. It’s very hard going, and slow, and we’re both too tired and washed out to keep up a positive attitude. My ankle around my achilles has started to really ache and Paddy’s shoulders are painful too. By 12:30 we’ve reached the bottom of the pass which starts with a stiff climb which we struggle up at 3km an hour. We’re feeling too rotten to take in much of the view and as we reach the final climb we both end up cursing at this poor German guy who is taking lots of photos of us from his jeep as we struggle pass. Despite having only eaten 2 iced buns and a handful of nuts each somehow we manage to reach the top by 2pm. 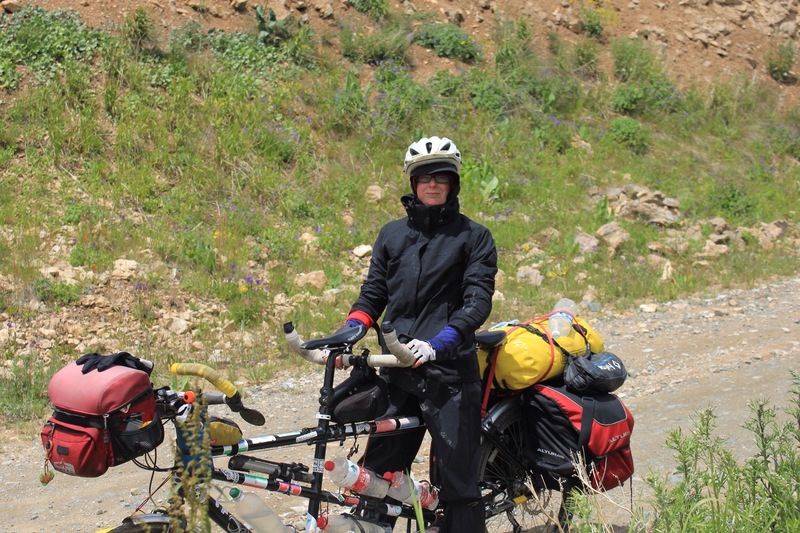 We still had 80km to Murghab, mostly down and flat, but we were both wrecked. Near the top of the other side we’re greeted by a cheery group of cyclists. With the news that the road would soon turn back into asphalt we spur ourselves on. At 3pm I decide I can stomach a cheese sandwich so we stop and I convince Paddy to have some too. We both feel much better for eating and thankfully the remainder of the journey is all paved if a bit bumpy in places. 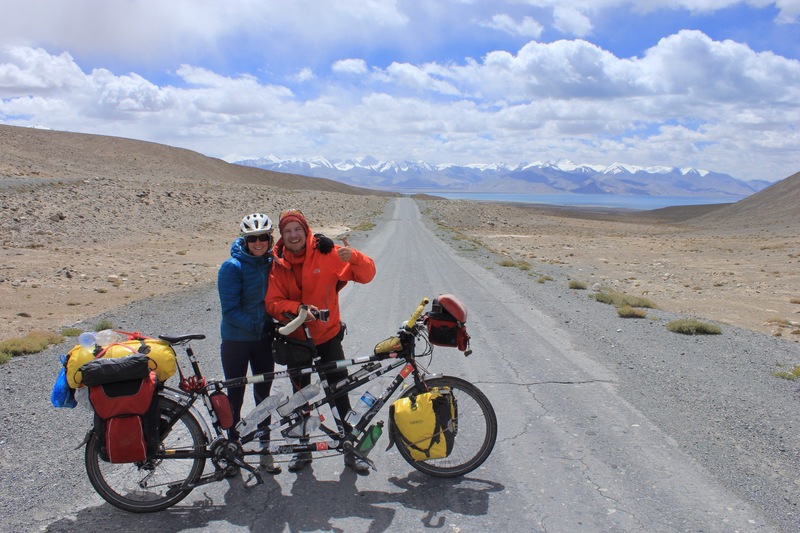 It’s pretty flat with a slight incline in our favour – exactly the kind of road where the tandem can really eat up miles and despite a strong headwind, with great effort, we manage to maintain a steady 25-27km for a good 90 minutes. By 6pm we’re having to stop every 15 minutes. Our bodies are giving up on us. I pat Paddy’s back and wave the swarms of mosquitos away as he leans over his handlebars with a horrible headache. At each stop we lie on the hot Tarmac getting ready for the next leg. 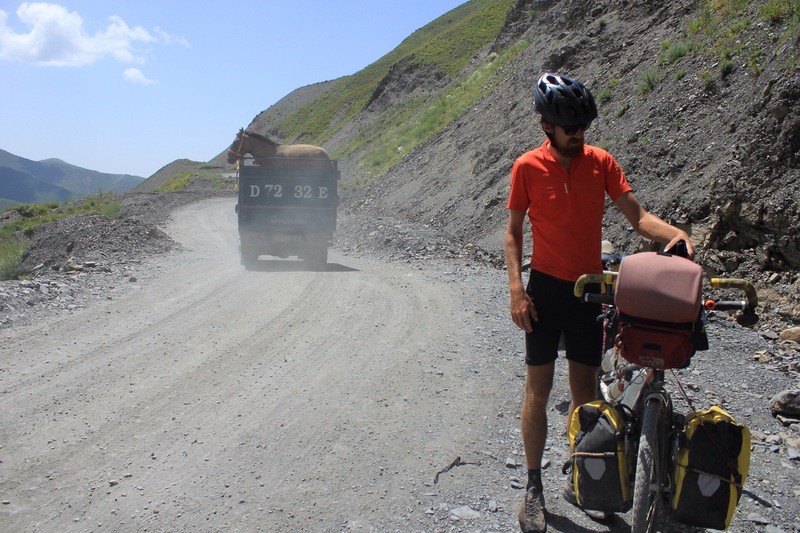 We finally roll into Murghab at 7.30pm and luckily meet two English cyclist who tell us about an affordable homestay. It’s a lovely place and we manage to bag their old room for just 30s each. After a home cooked meal and a hot shower we’re both feeling very content and are super glad that we were able to make it to a bed! Bring on that lie in! Festival going has always been a big part of our summer holidaying and with news from friends back home of their 2016 festival plans, we admit, we were feeling a little nostalgic. 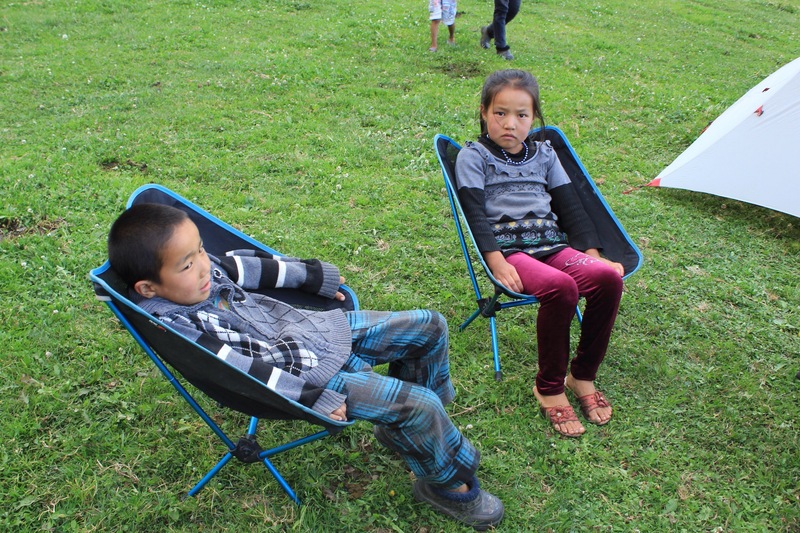 We were really glad therefore to have made it to our own little Kyrgyz mountain festival. After a cold night, we wake to find the sun beating down on our tent. We lie there for a while comfortably listening to the sounds of people bustling past us, children laughing and food being prepared – in the background we recognise the familiar low hum of a generator. 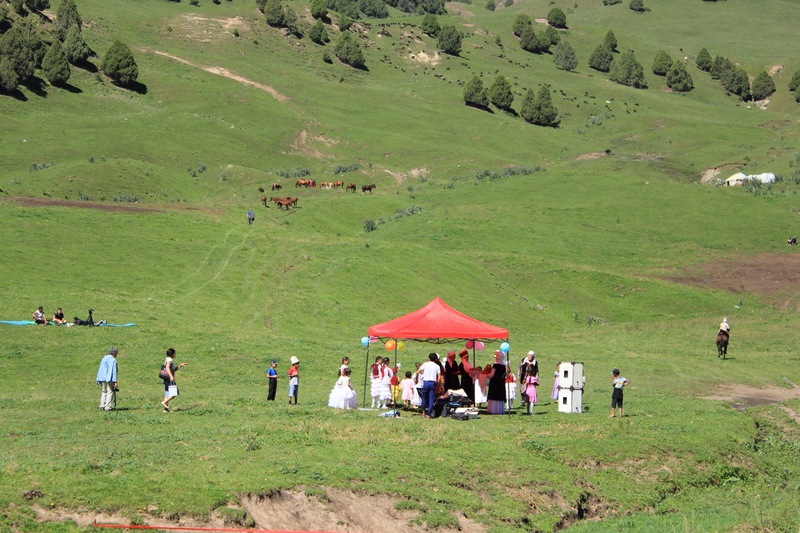 Crawling out of our tent we find children running around in traditional costumes under a cloudless sky and adults blowing up balloons to decorate some temporary red tents which have appeared on the edge of the field. 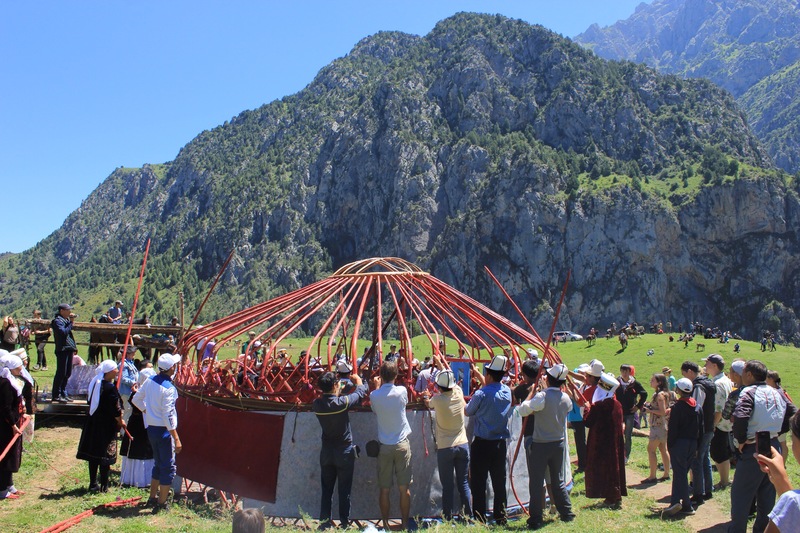 The backdrop is spectacular and we cook breakfast before getting ready to enjoy the day’s events which promised to include live performances, yurt building and traditional horse games. Paddy’s hopes for a beer tent were soon dashed but in all other respects it seemed we had found our very own ‘party in a field’. By 10pm lots of locals had started to arrive by both horse and car. Having gone back to fetch the sunscreen from the tent I find Paddy sitting cross legged on a large traditional shashlik rug surrounded by 7 or 8 local women. He’s encouraged to hold each of their children in turn. The Belgian guys who we had met the previous night were also there and at about 11am a large party of other tourists from Osh also arrived. The majority of people there were locals though. 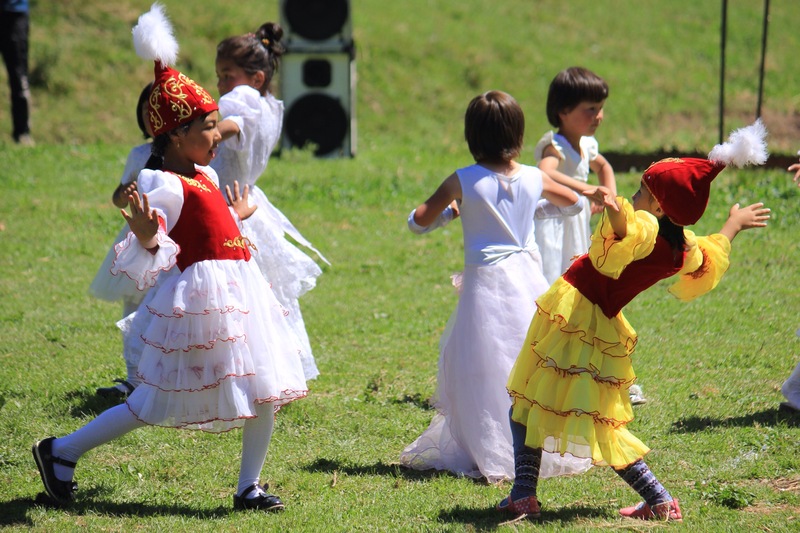 After a few opening speeches the festival kicks off in earnest with a couple of dance performances by local girls all proudly wearing their traditional outfits. Next a mixed gender professional music group led by a Manasachi who performs excerpts of the famous Manas epoch. 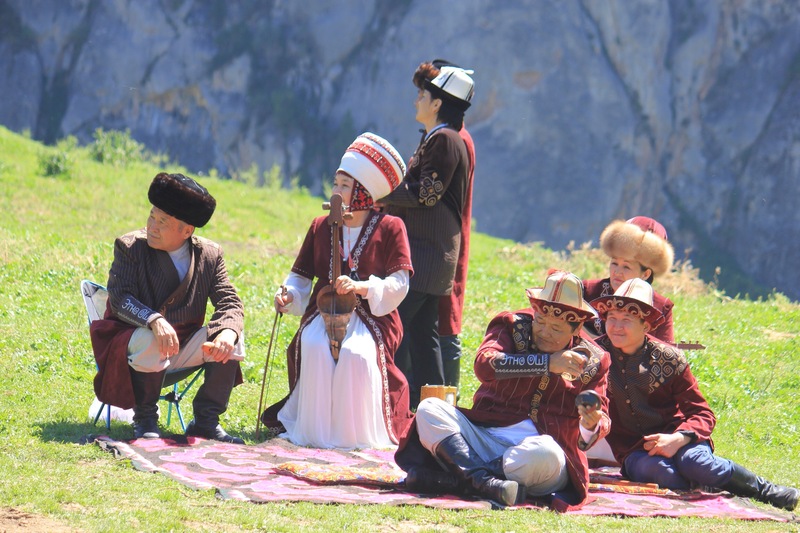 After the performances we are all told to turn around to face the mountain behind where a bizzare staging of what the announcer calls ‘the traditional nomad movement’ is taking place. 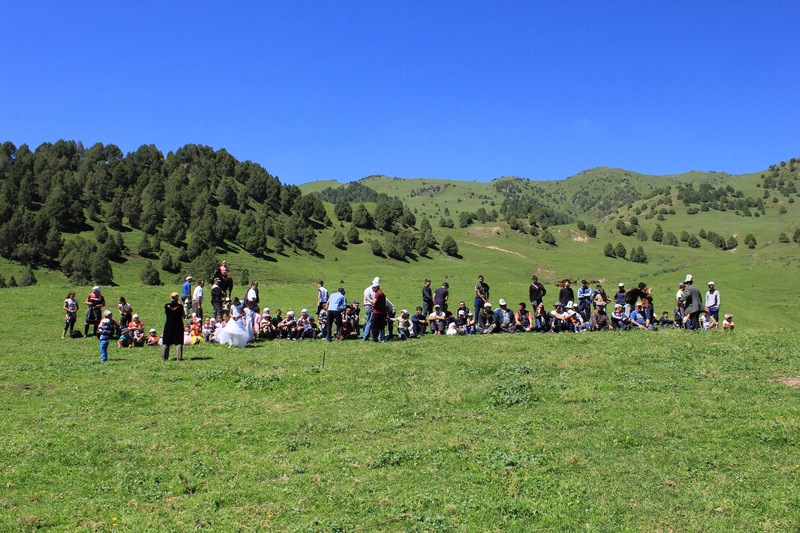 This involved around 40 people processing across the grassy slopes down towards a semi-constructed yurt. 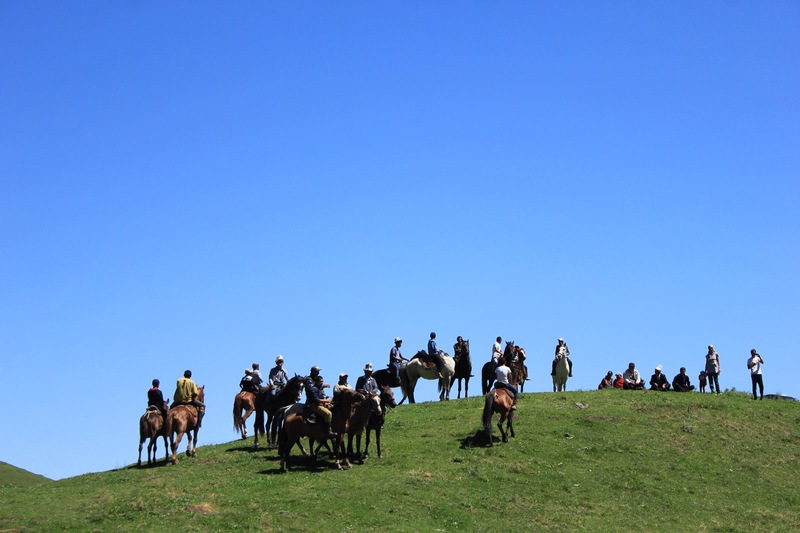 Many of them are on horseback while others are leading heavily laden donkeys and yaks. 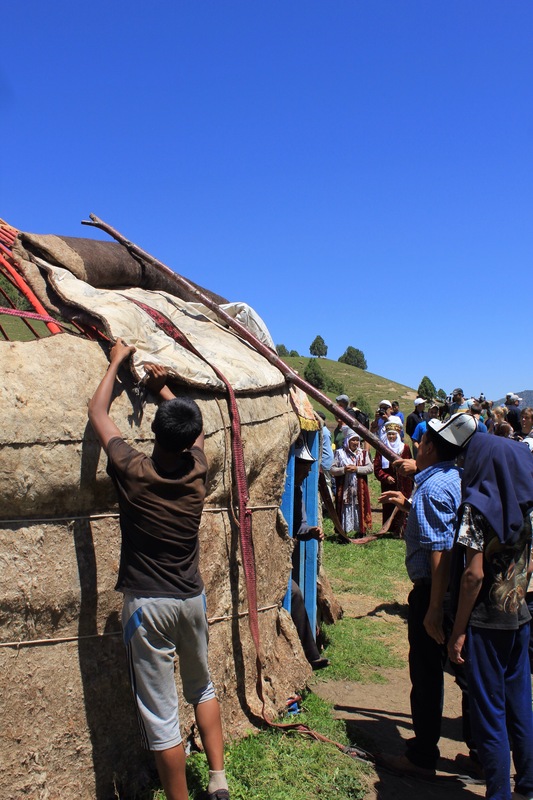 There is also a camel – who, in the middle of the procession, spooked by something, causes havoc by running back up the mountain leaving a trail of objects in its wake. 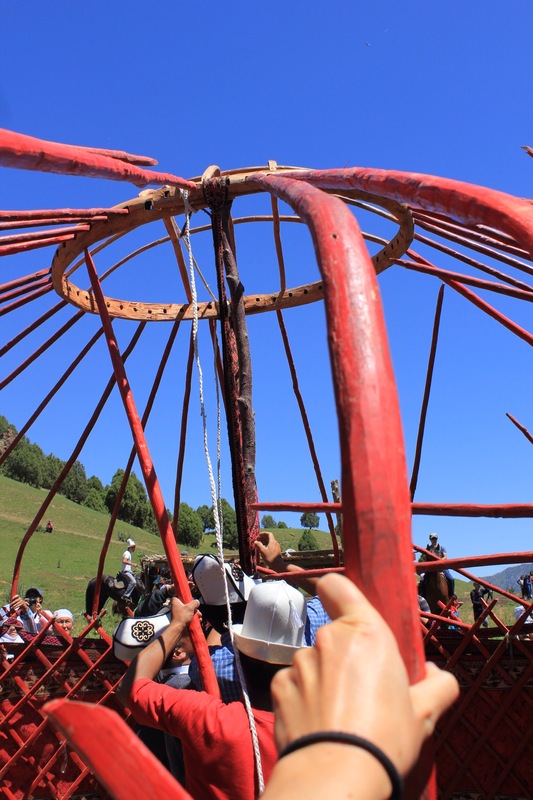 The yurt building that followed was great fun however and it was interesting to see how the whole thing is constructed. Paddy has sworn he is going to build one when we get back home. 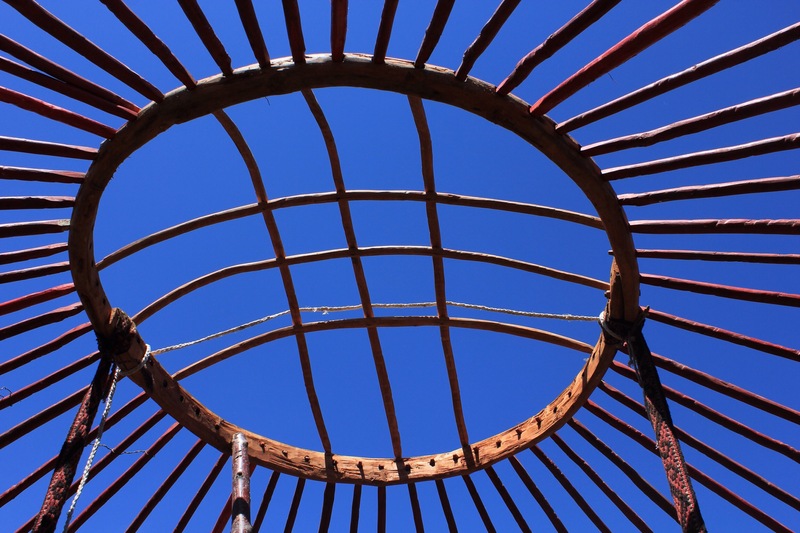 Once the wooden trellis walls are up the roof goes up by attaching about 60 curved beams to the circular tunduk which acts as the kind of ‘key stone’ to the whole structure. 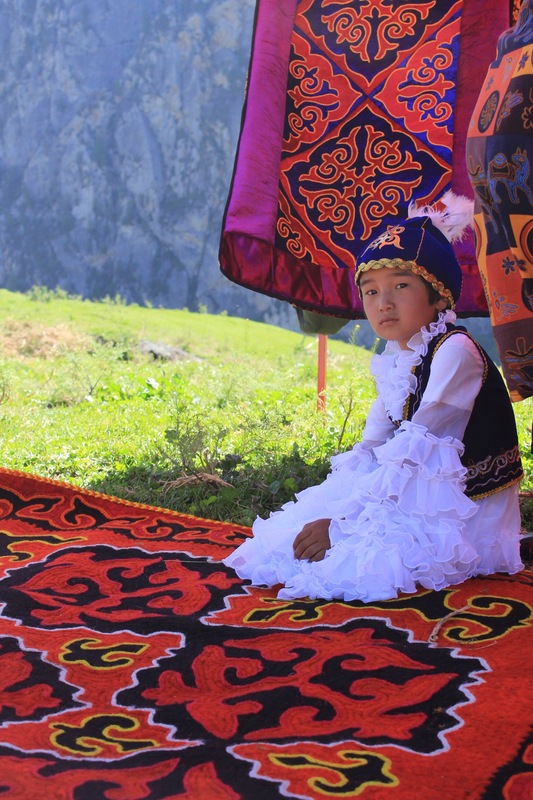 The shape of the tunduk is represented in the Kyrgyz flag. Once the wooden beams are tied together with rope and long belts of brightly coloured felt ribbon, the thick, sheep’s wool covers get wrapped around the exterior – first the walls and then the roof. Long ropes keep it all in place. 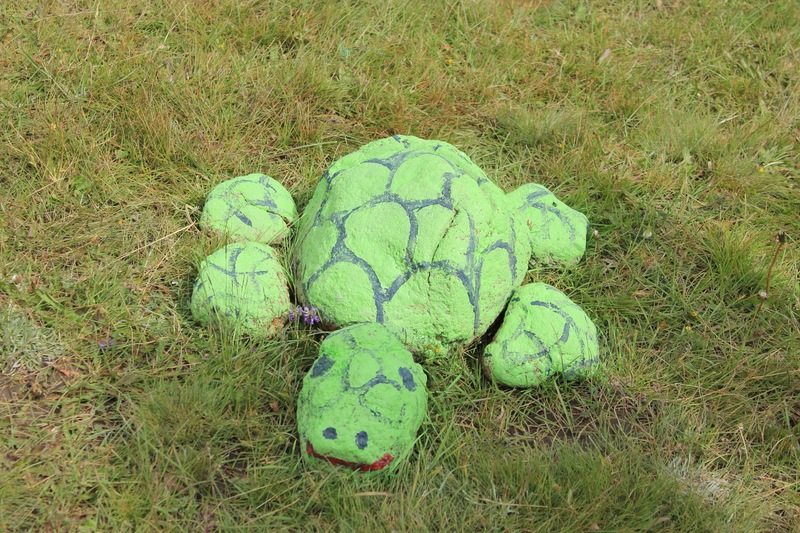 A team of six to eight skilled men can erect one of these things in around 60-90 minutes. After a spectacular lunch we’re back in the field ready for the games to start. 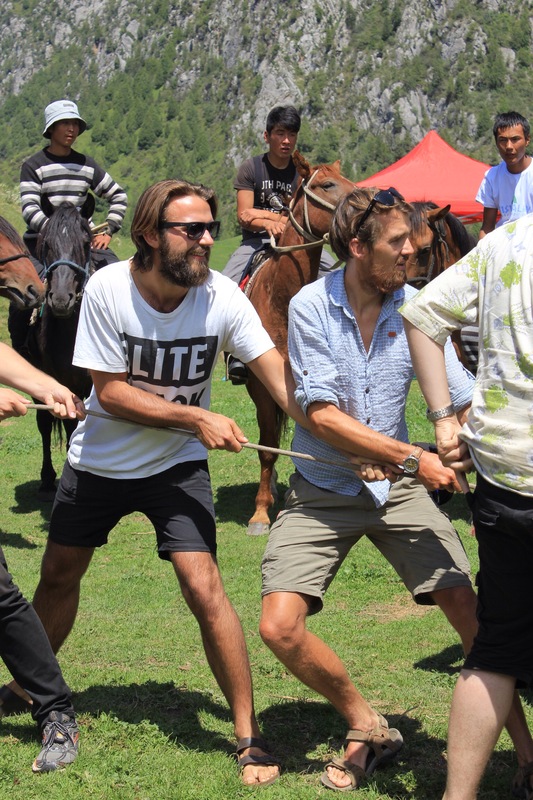 The first is a good ol’ fashion session of ‘rope pulling’ or as we know it – ‘tug of war’. We tourists are asked if we’d like to form a team against some locals. Paddy gets involved in the men’s team and I have a go in the woman’s round. 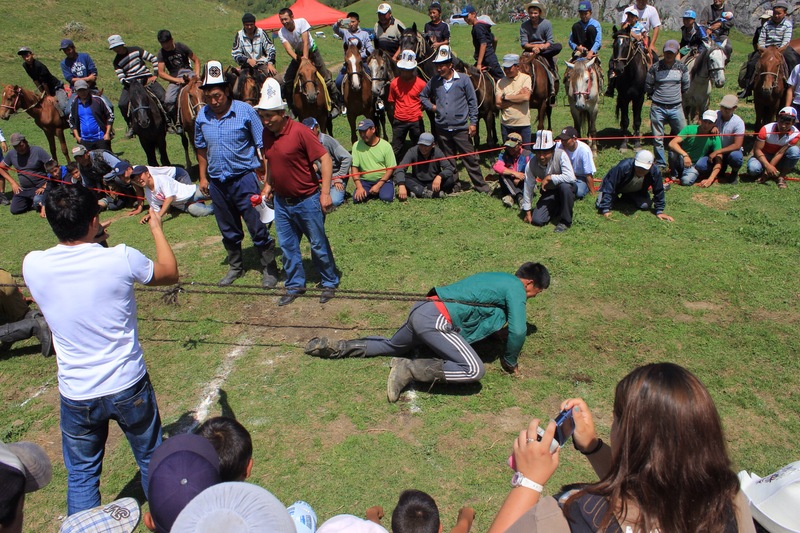 After yak pulling we were treated to a short stint of horseback wrestling followed by ‘coin picking’ where each opponent has a go at bending down from their horse to pick up as many coins from the ground as they can. 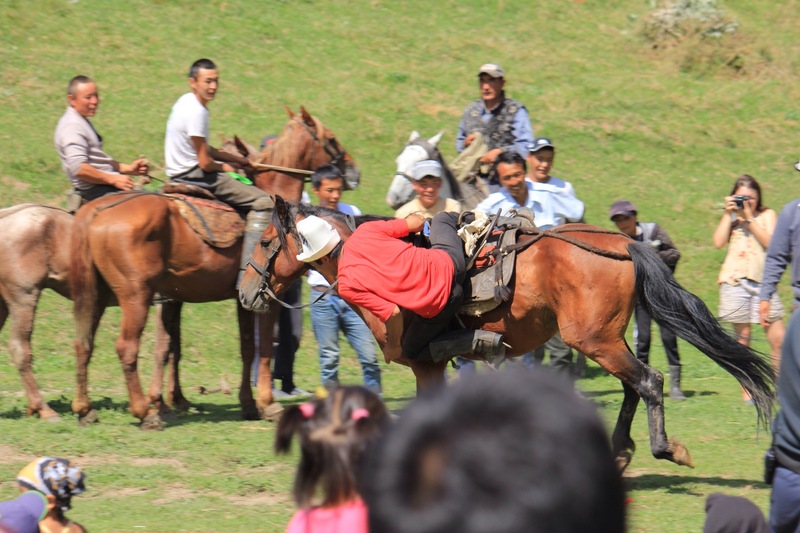 They do this while the horse is cantering at top speed; it’s pretty crazy! Nora our Dutch friend who is travelling across Asia on her motorcycle bravely took a turn at the coin picking. Unfortunately she didn’t manage to get any but she was pretty close and we were all very impressed with her brave attempt. 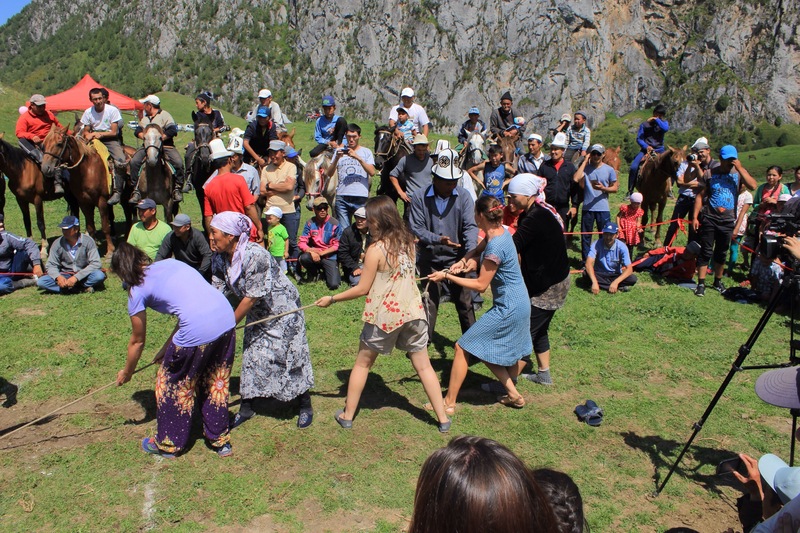 The day finished with the exhilarating traditional field game of Ulak Tartysh. 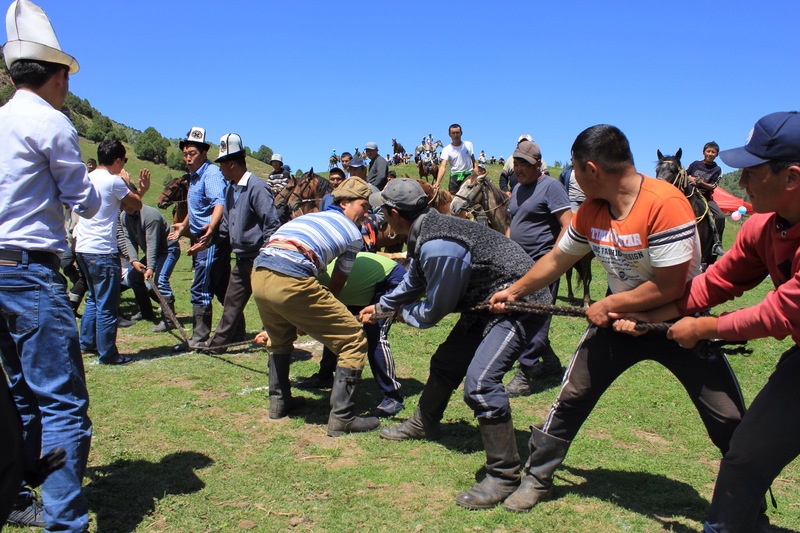 The only way I can describe Ulak is by comparing it to a game of rugby union. But all the men are on horses and instead of playing with a ball they play with the beheaded carcass of a goat instead! 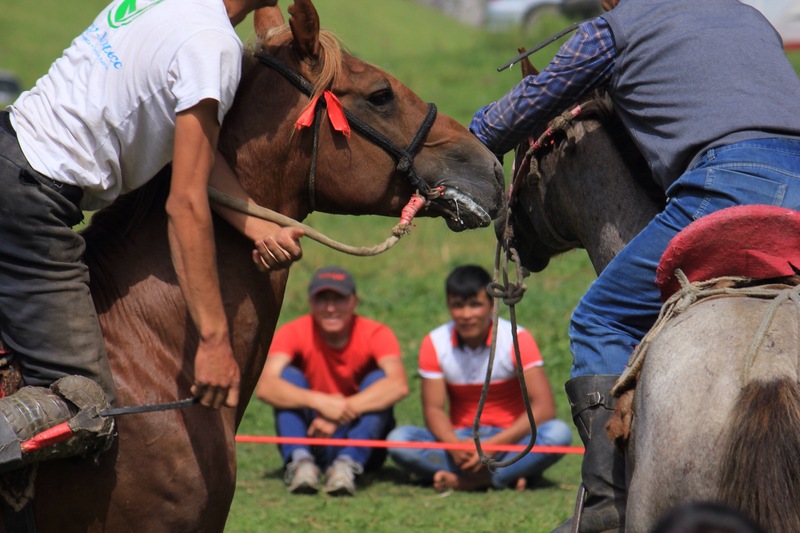 The aim of the game is to either pick up the carcass from the ground or wrestle it from your opponent before riding full pelt towards your goal ring, where the animal is dropped, earning a point for you team. As you can imagine, it’s carnage, BUT incredibly entertaining to watch! 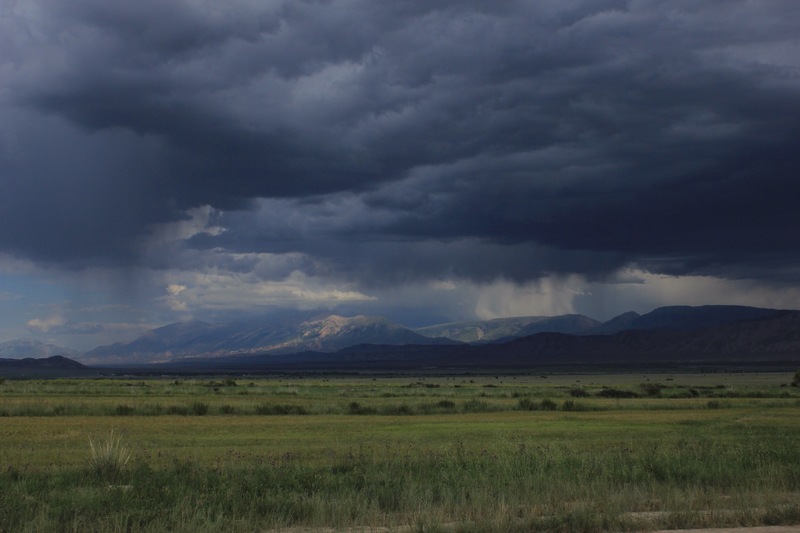 The weather stayed warm and dry the whole day and all in all, it was a very fitting end to our time in Kyrgyzstan. 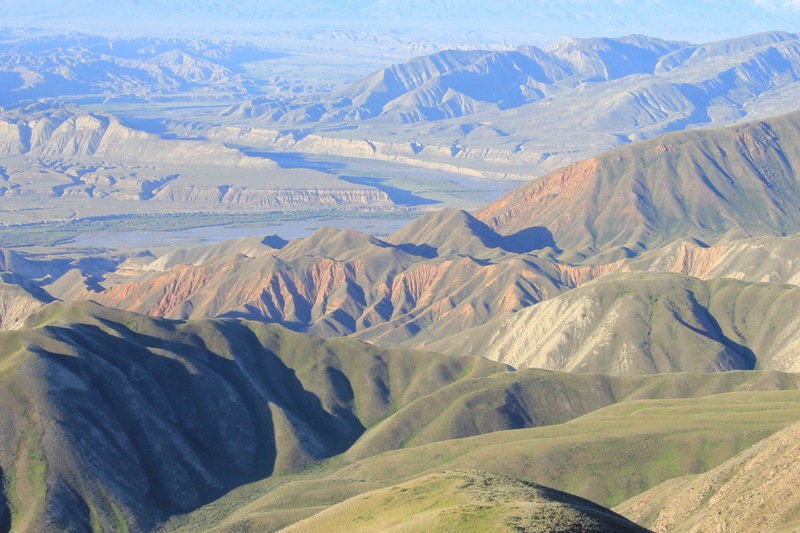 It’s now time to head south, up and over the Tajik mountains. 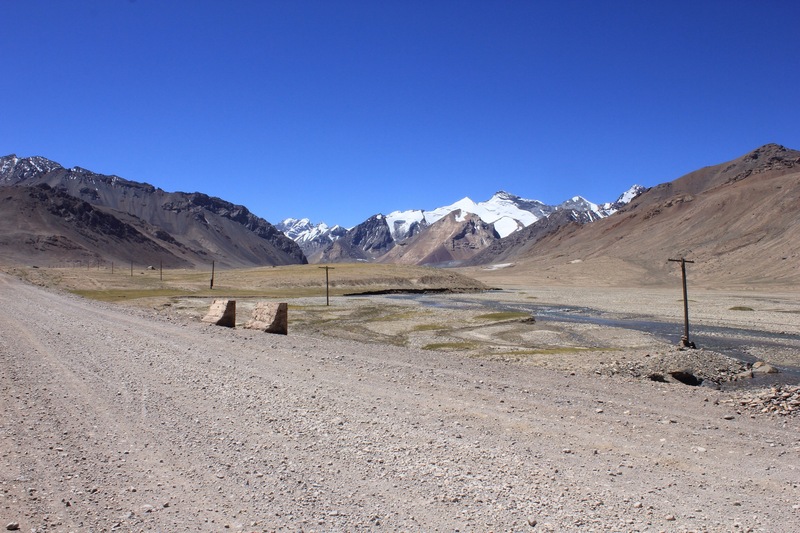 The Pamirs await! 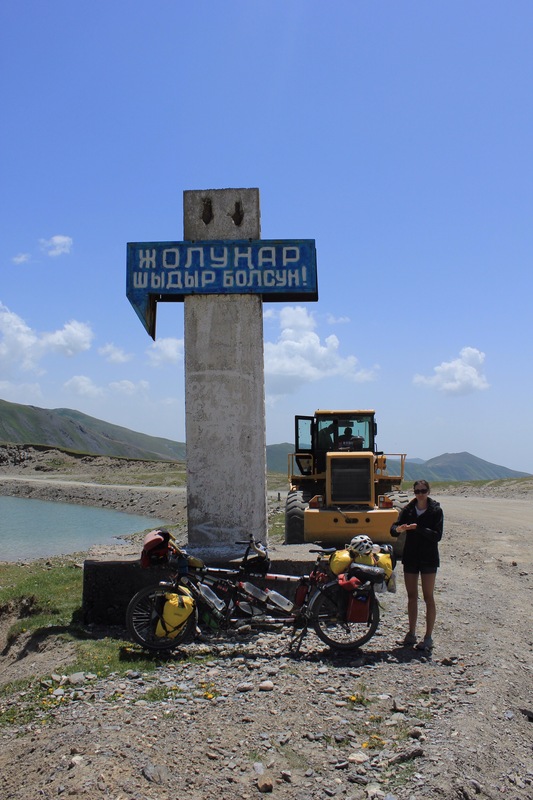 The visa applications and the ride south from Bishkek via Song-Kol lake had both eaten into our schedule more than we expected so we were now planning to cross the Tajik border a week later. 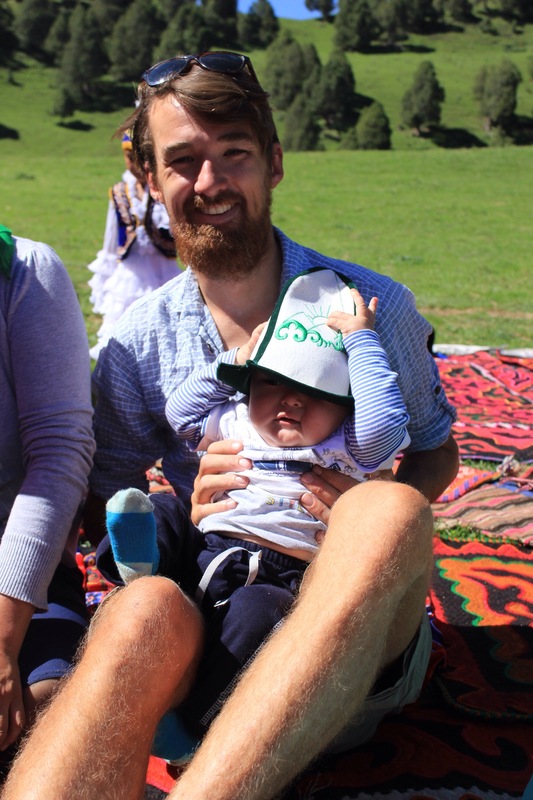 We were still OK on time as we had a 45 day visa for Tajikistan and there was no point stressing. 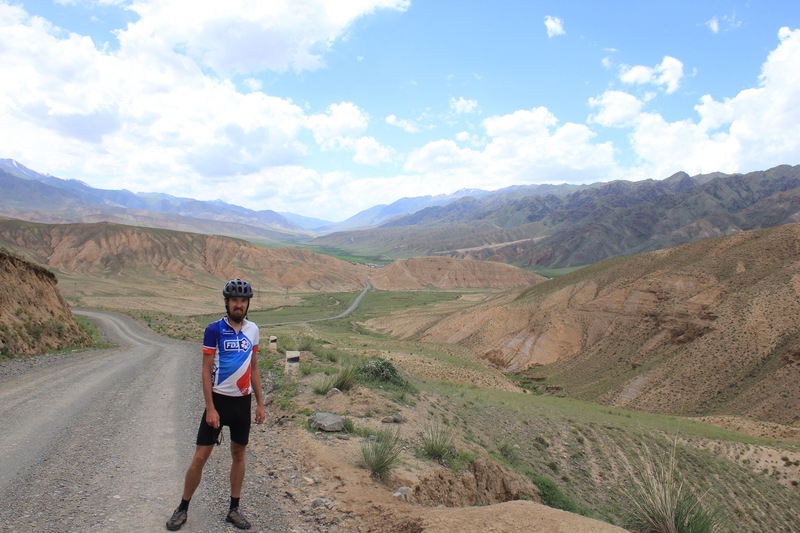 In Osh we met a couple of other cyclists who had completed the Pamir, including the Wakhan valley, in around 22-24 days. 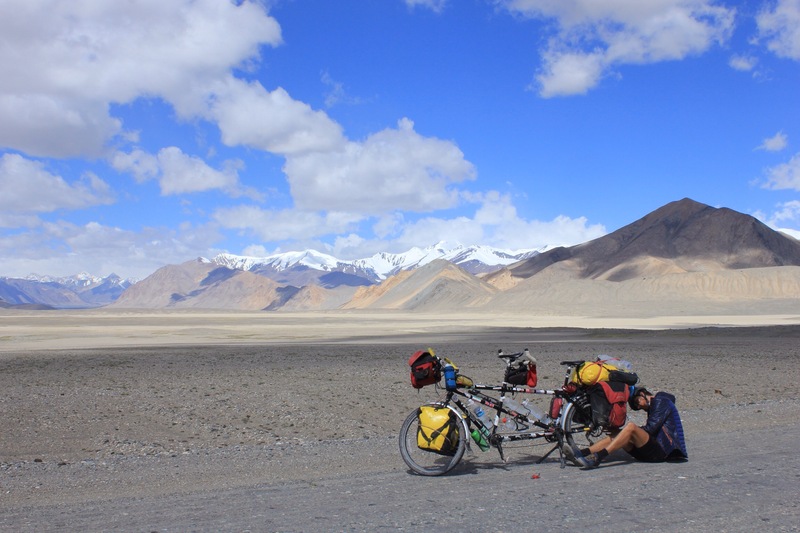 Our route to the border crossing would see us backtrack along the M41 back up to Sary-Tash where we had stopped for a night coming over the Irkeshtam pass from China 40 days previously. 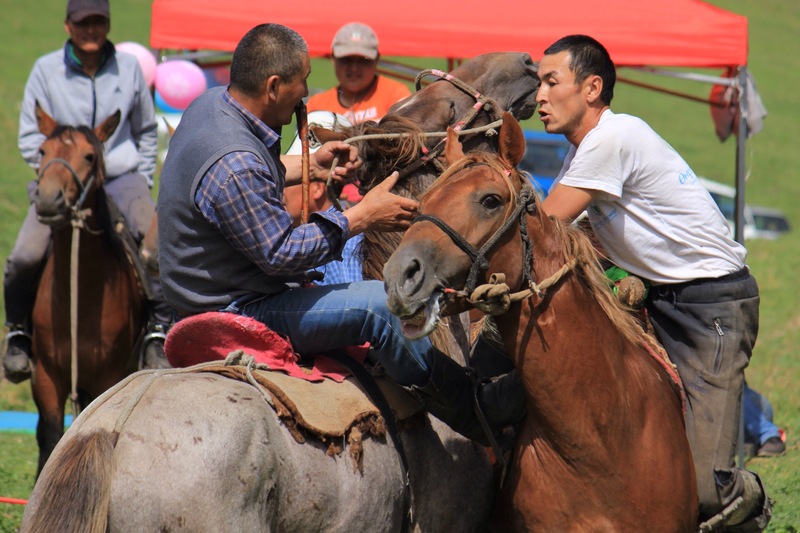 We had heard that an annual horse festival was taking place over the weekend somewhere in the region so we were keen to see if we could fit this in on our way through. 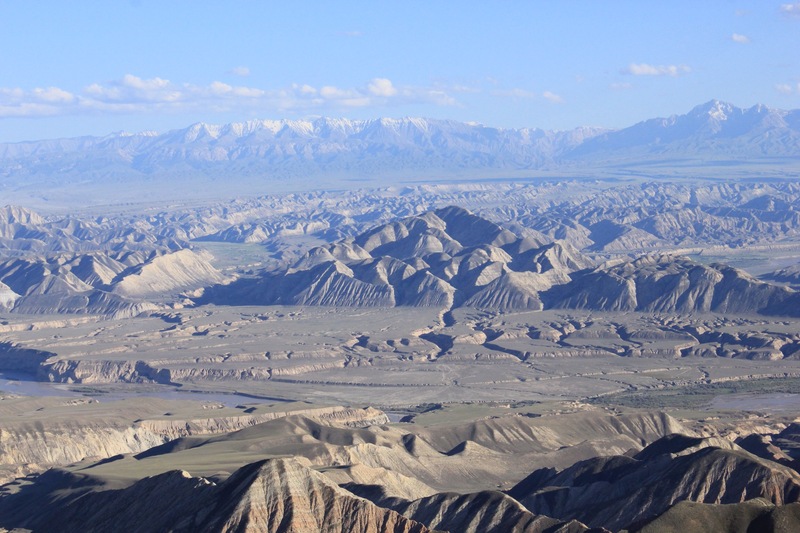 After visiting the website we discover it’s directly on our route towards the Tajik border, 5km from Gulcho. 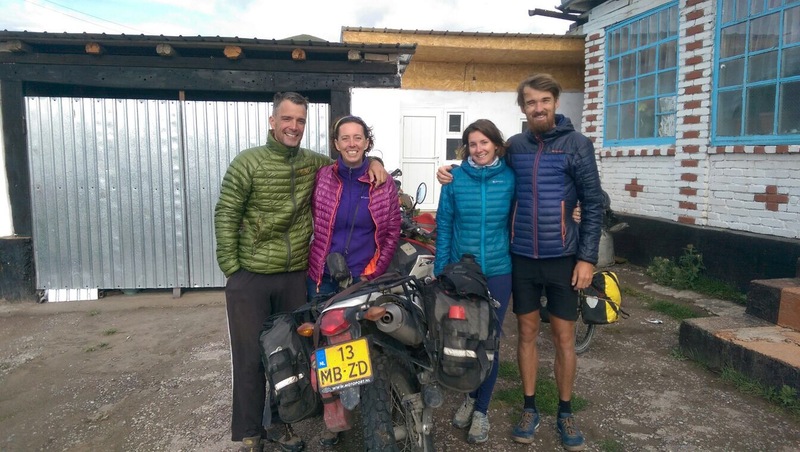 We leave Osh on the Friday morning having spent Thursday cleaning the bike, stocking up on supplies and catching up with news back home. 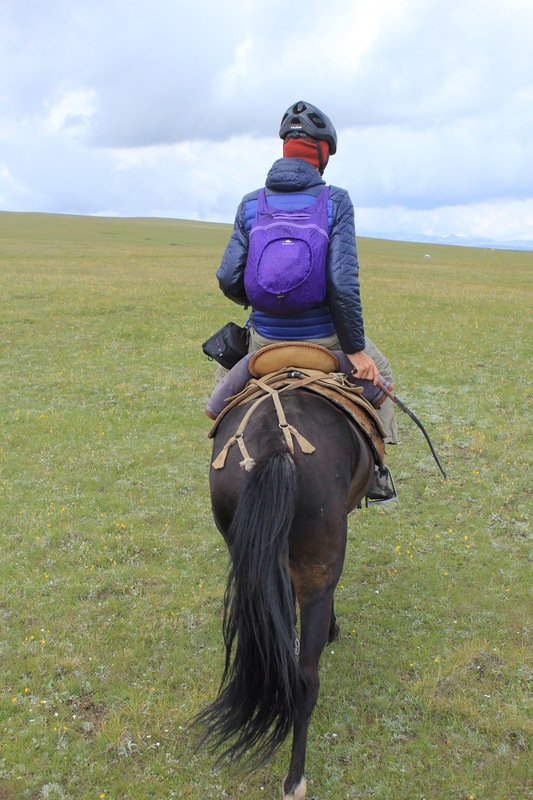 We were keen to get to the horse games site that evening so we didn’t miss any of the festivities the next morning but the ride involved a long gradual incline, plus a hard climb over the Chyrchyk Pass. This meant we needed to hitch a ride. 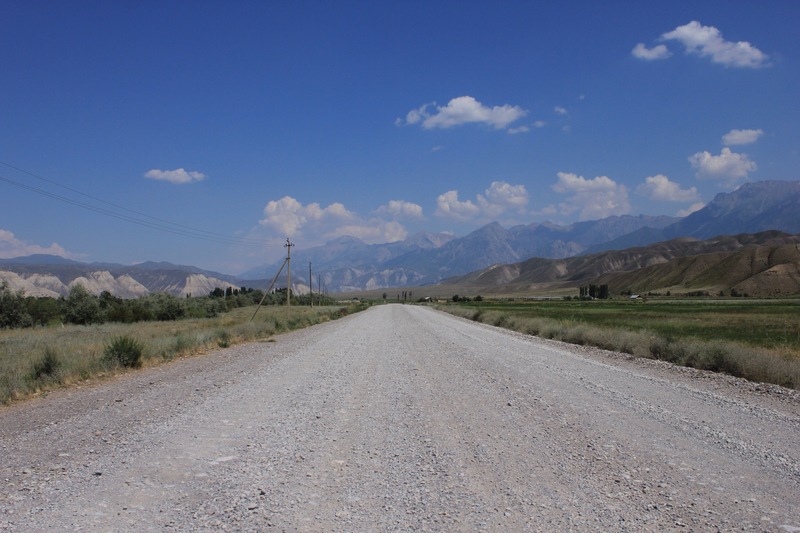 We cycle 15km out of Osh and then pull up on a long straight section. Traffic is a bit on the slim side and all the vehicles which could take the tandem seem to be turning off or stopping just beyond where we’re stopped. After an hour we admit defeat and get back on the bike and cycle another 10km up the road. We stop and make lunch and then try again. A nice chap and his little boy stop and we lift the tandem fully loaded into the back of his pick-up truck. He’s only going to the next village 13km but it still helps a lot. Traffic is even slimmer here but after a few tries we managed to hail down a second ride and luckily this guy is going all the way past the turning to the festival. Luckily for us an empty pick-up truck trundles pass and we manage to steal a ride for the next 7km. After this the track gets VERY steep and the last kilometre is impossible for us to ride so we have to push. Sweaty and breathless we push the tandem over the last ridge and the valley starts to open out. Paddy climbs up a green slope to check we’re in the right place and comes back accompanied by two adolescent boys. 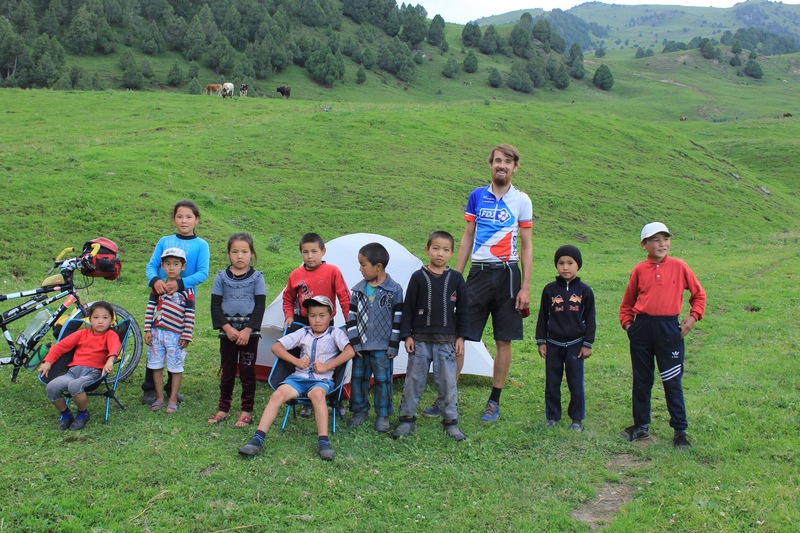 They help us push the bike up the last 500m and we find ourselves on a grassy plain, surrounded by pine wooded hills dotted with clusters of yurts. Later, some guys from Belgium who have hiked up here come over to say hello and we sit chatting with them while cooking dinner. Happy to hear that the festival wouldn’t be kicking off until 10am we snuggle down and look forward to a lie in. We leave our amazing mountain top view and complete the final 3km to the top of the pass. 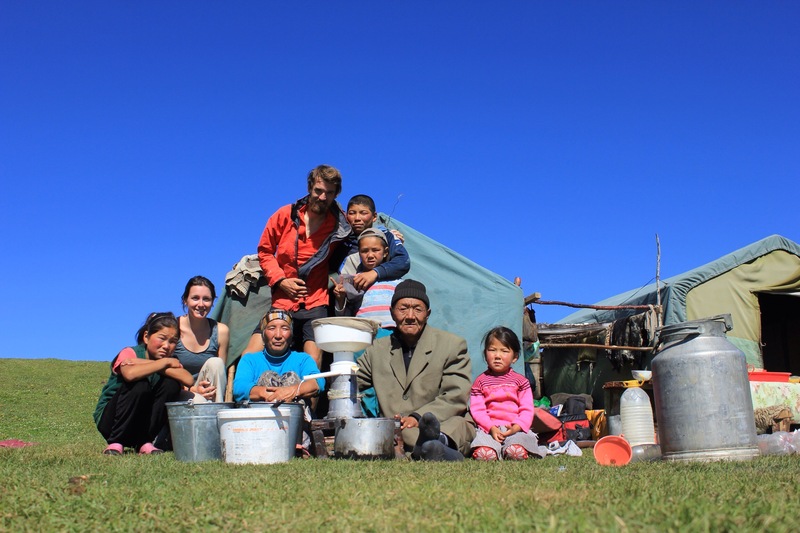 We’re really running low on water and there is no sign of any streams but thankfully there is a collection of yurts at the top , and this lovely family replenish four of our bottles. We spend some time with them before heading over the top and back down to the next valley. The rest of the day is very up and down and we make slow progress. We meet more motorcyclists on the road and stop to chat for a while. 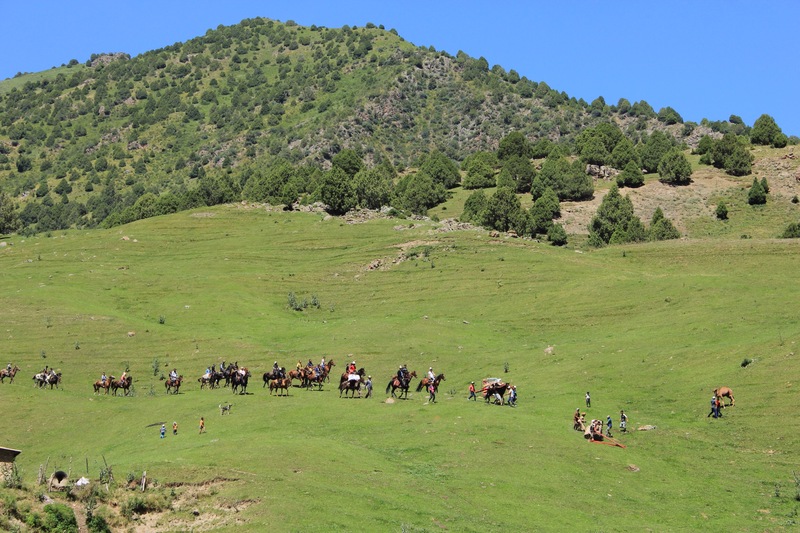 After 5 and a half hours in the saddle we stop and camp in a meadow just outside the small village of Dodomol. If possible, the road got worse today. After a short climb we find ourselves losing a lot of height once again until we reach this flat stretch of road leading to the large town of Kazarman. The washboards are relentless and we manage an average speed of just 8.6km/h. We’re both a bit worn out so decide to give ourselves a rest and find a nice home stay for the night. It’s the first shower we’ve had in 7 days! Bliss! Kazarman’s centre isn’t the most picturesque! 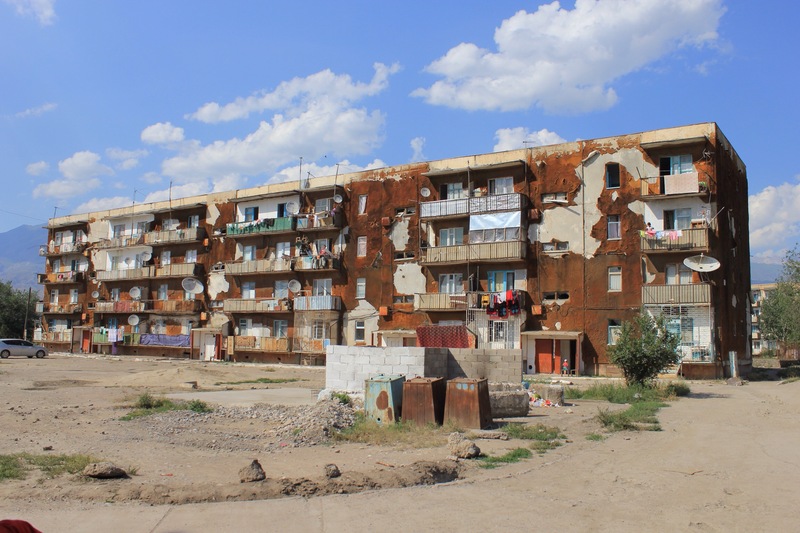 The streets are lined with these rather depressing looking soviet apartment blocks. That orange stuff is peeling insulation… Asbestos perhaps?! The people are really friendly though and it’s a great place to stock up on food, snacks and water. 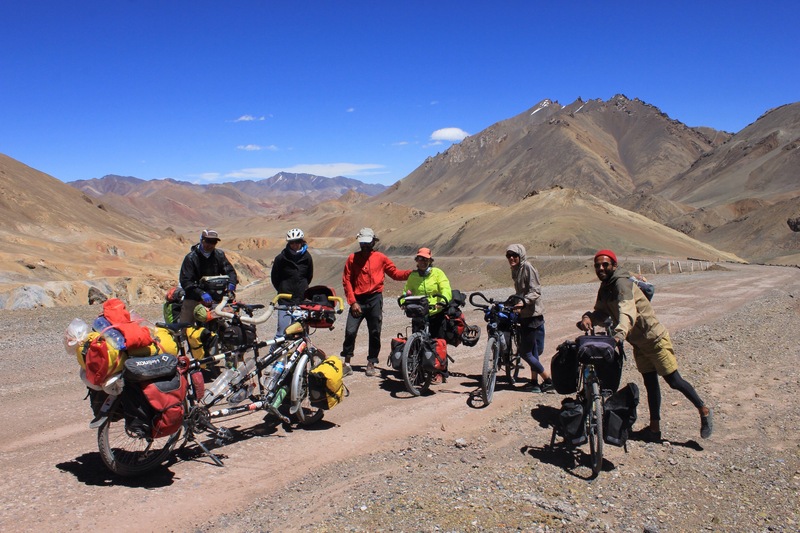 Day 5 saw us start to tackle the tallest (but final) mountain road – the Kaldama Pass. It’s incredibly hot and we spend a long time filtering 9L water from a muddy stream. We keep climbing through the green hilly landscape. The traffic isn’t too bad but the road is still frustratingly slow. We drop down to a big river before camping next to some yurts. We’ll have a hard climb tomorrow morning but should complete the pass before lunch. We manage an early start and The War on Drugs, Radiohead and Paul Simon blast out of our speaker helping us to keep climbing. By lunch time we have reached the top! It’s a bumpy trip down and gets hotter and hotter as we lose height. Luckily there are plenty of springs to collect water. 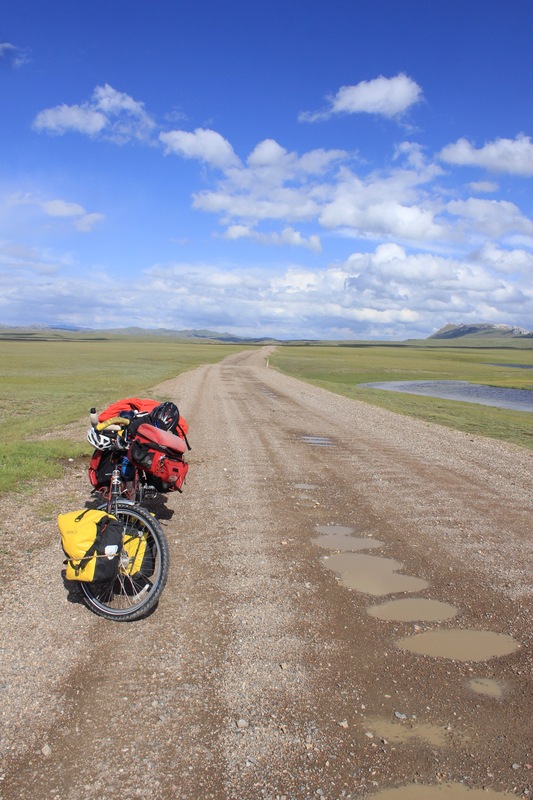 After eight days on the gravel road we’re delighted to find ourselves back on Tarmac!!! 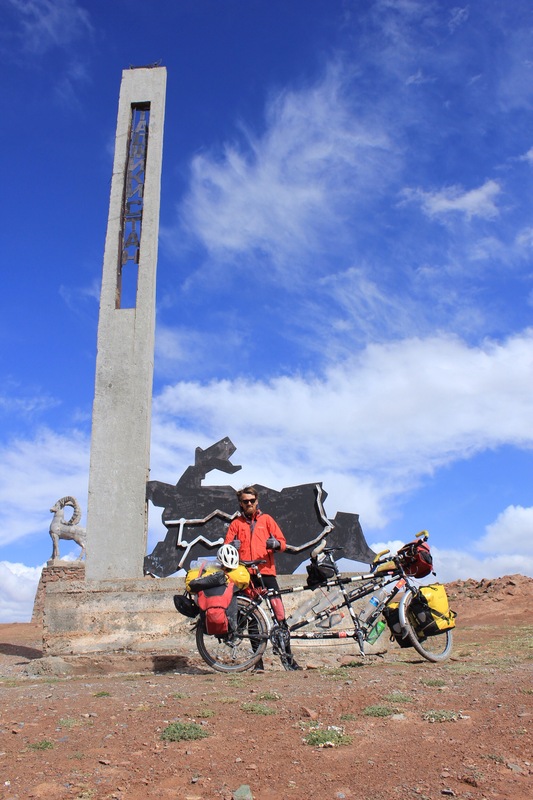 Our seventh and last day would see us cycle the remaining 43km to Jalal-Abad, finally completing our big loop of Kyrgyzstan. We enjoyed much better weather for our second day of riding and we set out west around the lake, this time with Aitbek’s nephew. 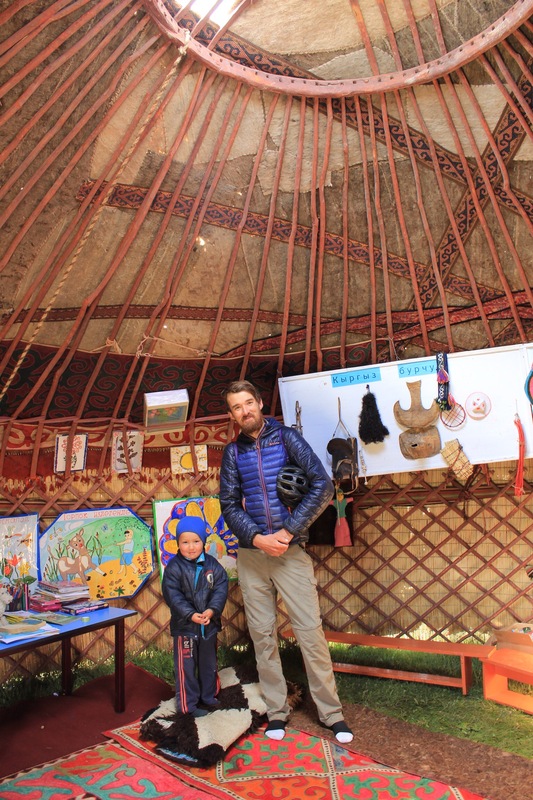 He takes us to the small nursery school where there are some very cute rock animals outside a yurt brightly decorated inside with the children’s recent art work. It’s a nice ride but by 3pm the weather starts to roll in so we start to head back to the yurt. The next morning we head off into very stormy, cold and wet weather. It’s not a long climb up to the pass out of the lake but the hail doesn’t stop for a good 2 hours and by the time we reach the summit we feel pretty battered. The weather is incredibly localised and as we make our way down the other side via a spectacular switchback road the sun appears. The scenery is the nicest we’ve seen on this ride so far – pine forests and deep green valleys. The road gets worse as we head down with some very bumpy washboard sections. It’s impossible to get up to any reasonable speed but at least the weather holds out despite some very moody cloudscapes to our left and right. 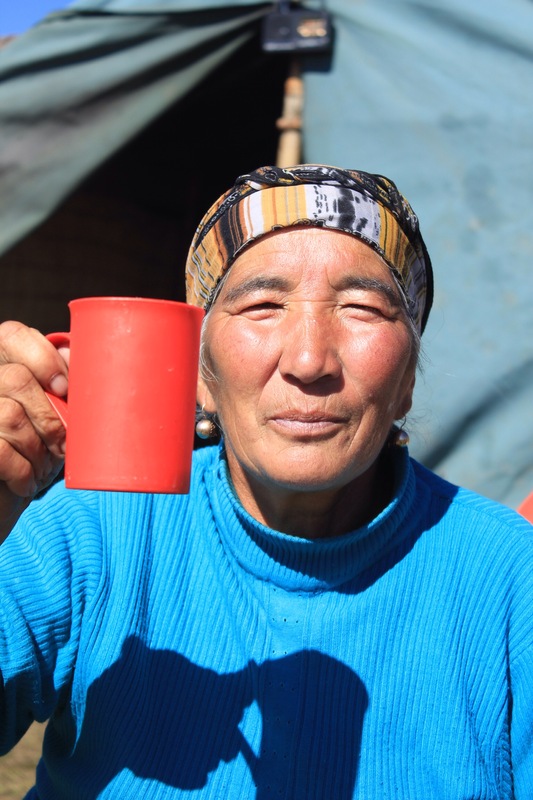 We camp near the village of Ak Tal where we’re able to stock up on food and diesel. We’ve lost a lot of height so it’s much warmer the next day giving us a chance to dry out the gear. The road continues to be a bumpy gravelly track. 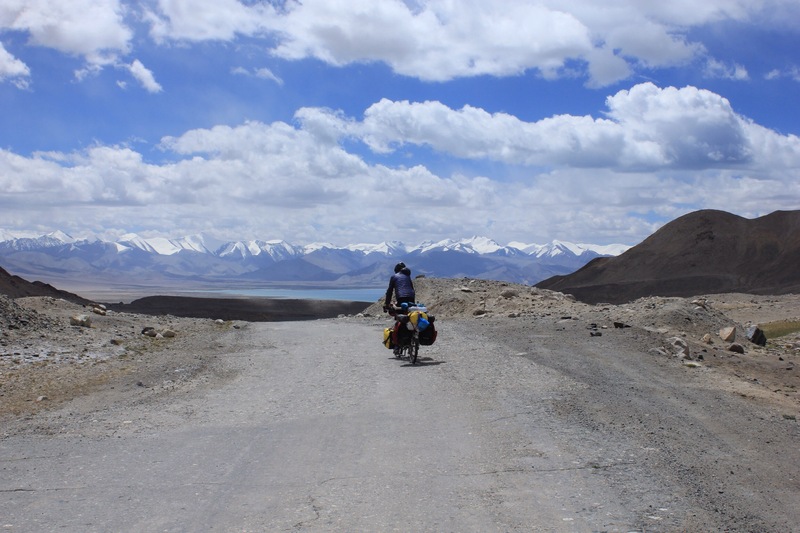 On the long straight stretch before the climb up to the town of Kok-Jar we notice that our back rack isn’t sitting right which is affecting the back brake system. The bolt holding the rack has sheared off. Paddy spends a long time getting the bolt out and then coming up with an alternative to the spacer we’ve lost along the road somewhere. He ends up using a number of washers and nuts. We get going again and reach Kok-Jar by 2:30pm. We meet a nice Swiss girl cycling in the opposite direction and she tells us we have a big climb ahead. We push onwards hoping to get to the top before calling it a day. 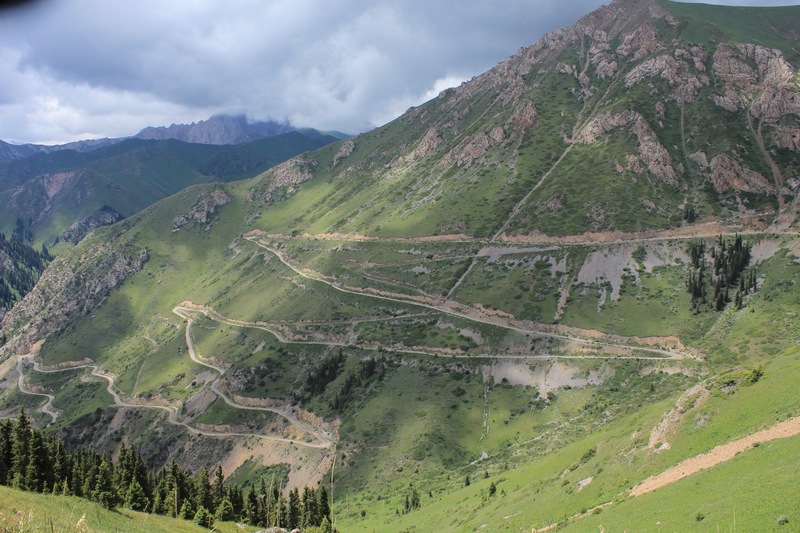 A long, hot, steady incline leads up to the climb proper which consists of a series of steep switchbacks. By 7pm we round the first mountain and are suddenly faced with this humdinger of a view. It’s breathtaking! Although we have a few more switchbacks to complete we can’t resist stopping to camp in front of these amazing rock formations. We can see for miles. It’s one of those genuine ‘is this real’ moments! We’ve a long way to go still until we reach Osh but views like this make all those bumps and climbs worthwhile. 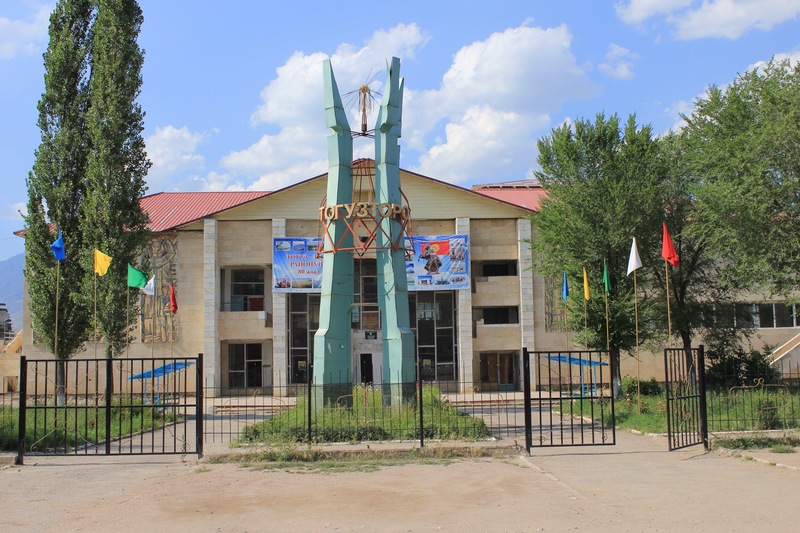 Our next destination would be Song-Kol a 100km ride from Kochkor. 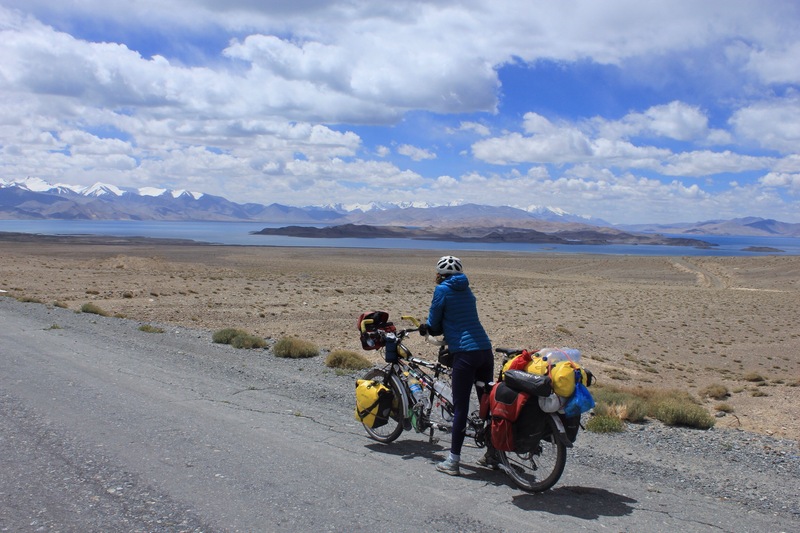 The lake itself sits at 3100m so we had some climbing to do and we were aware that the paved road would end with a turning off at Sary-Bulak. From there, we’d be back to dirt track for a good 5 days. The plan was to reach the south side of the lake by early evening of the second day. 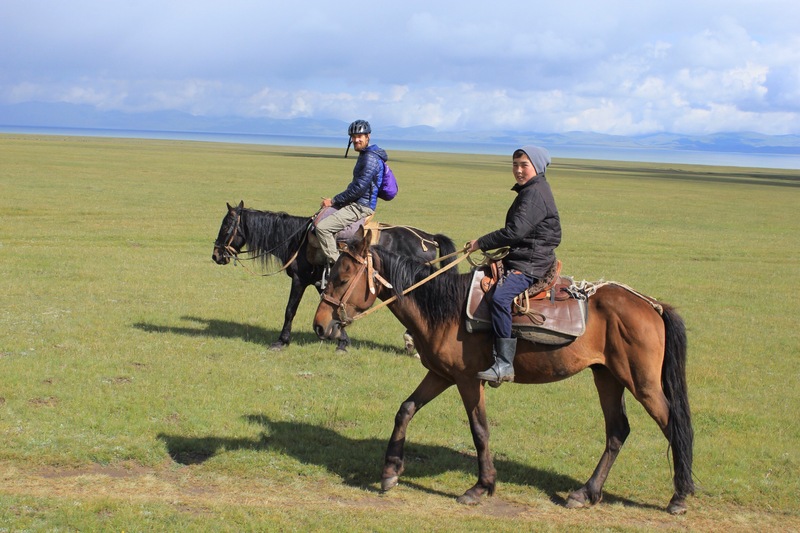 Having contacted a number of community tourism agents and been quoted an astronomical fee for horse trekking we had decided we would sort something out ourselves once we arrived at the lake. 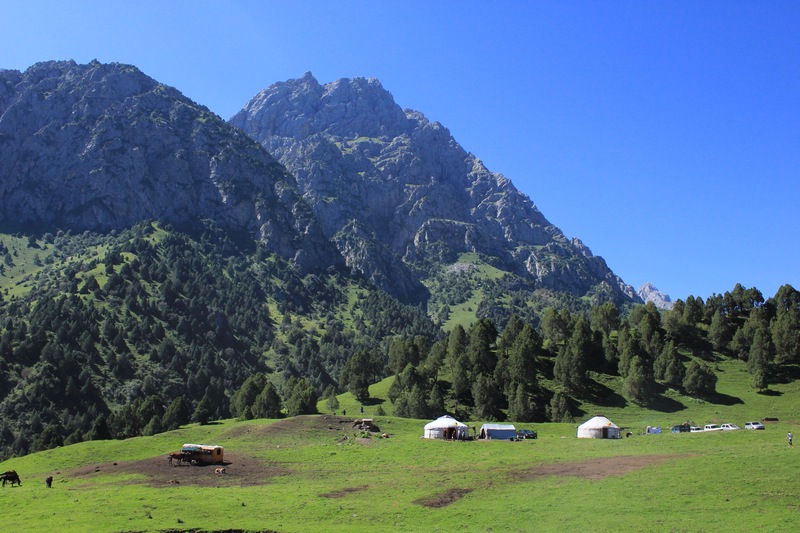 We had heard it would be easy to find a number of yurts offering treks and we weren’t too worried about having an English speaking guide. The rain held off for the first day and we enjoyed the gradual climb up towards the turn off. Paddy recently downloaded the audio book of Thomas Pickerty’s Capital so we brush up on our economic and social science history during the ride. At lunch Paddy notices that our front tire wasn’t looking too healthy… Same problem as our recent back tire which we replaced in Bishkek. We decide to change it before it bursts on the dirt road and punctures the inner tube. Lucky we brought that second spare!! We turn off onto the dirt track – the road for this section isn’t too bad at all and we make fairly good progress. The countryside is very beautiful and it felt good to be back in the wild mountains again. 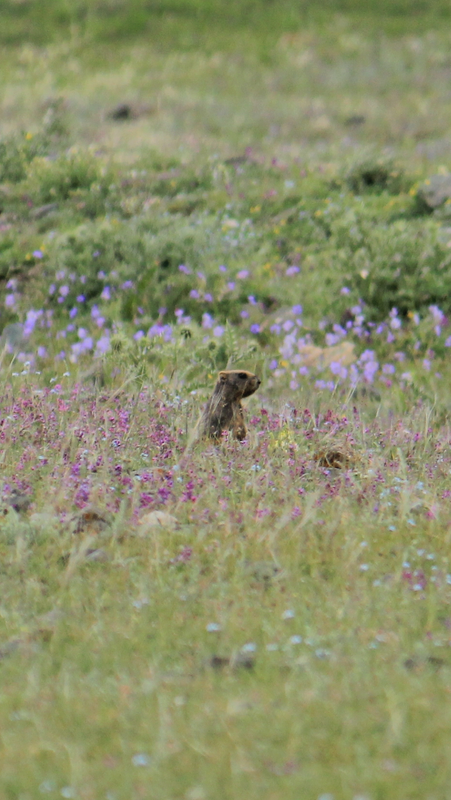 We camp in a field near the road that evening and we finally manage to capture the ground hogs on camera. The second day saw some pretty horrible weather roll in including some bitter hail storms at the top of the pass leading to the lake. We sheltered in a yurt for a good 90 minutes eating our way through bread, jam and cream. The weather then cleared long enough for us to cycle around to the south side of the lake. We meet a couple of other cycle tourers on our way round who are also sheltering from the bad weather. We pass a number of yurt clusters and as we round the corner, the vast lake stretches out in front of us. By 5pm we’re both starving so we make a quick stop to rustle up some cheese and cucumber sandwiches. 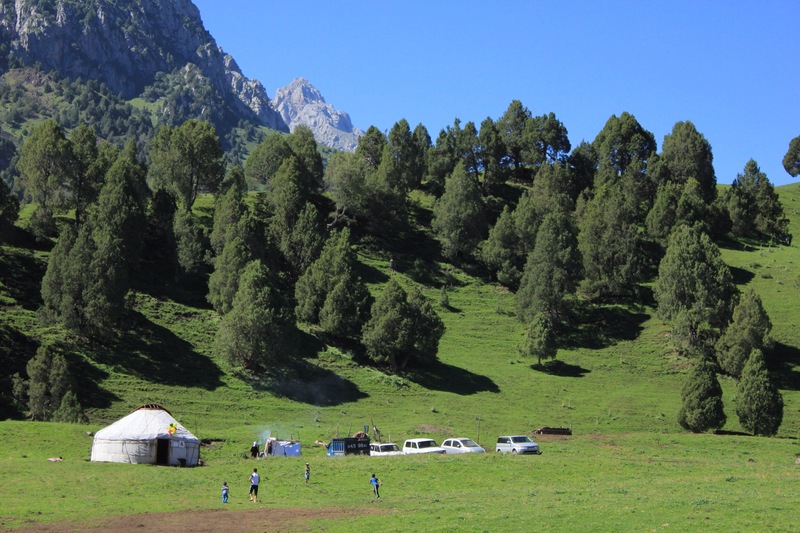 We cycle for another hour at which point we spot a large yurt complex just off the road so we cycle up to enquire about trekking opportunities. We’ve stopped at a good spot but no one in the family speaks English and both our Russian and Kyrgyz barely stretch pass a few simple pleasantries. After a lot of gestures, drawing of pictures and looking up words in their dictionary we manage to fix a price for a three day trek. It was tricky as the prices for each thing seemed to fluctuate a lot but we got there in the end! It’s A LOT cheaper than anything quoted by an agent and he confirmed we could take our tent with us meaning we wouldn’t need to pay for accommodation. We camped next to their yurt that night and cooked up an omelette, excited about the next morning. 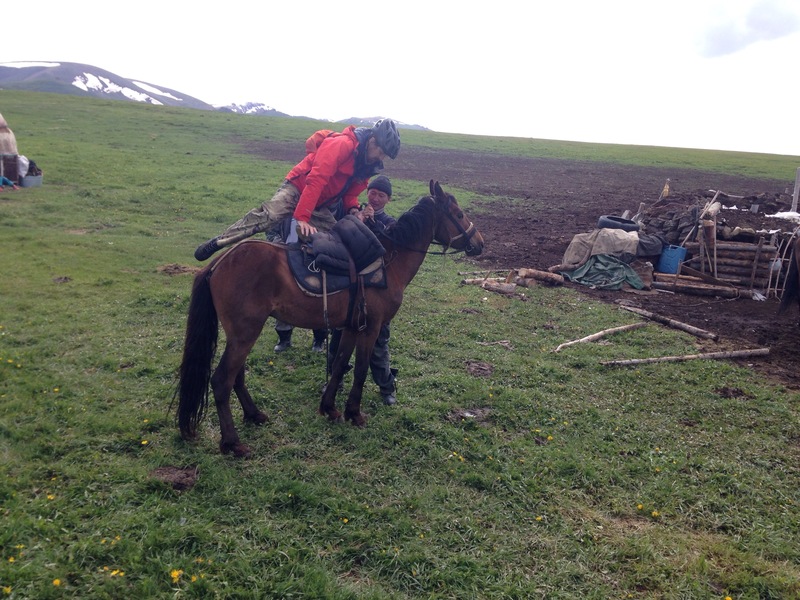 Up to this point, Paddy’s experience of riding stretched as far as a day trip on a Pygmy horse in Iceland – he was able to touch the ground with his feet on this trip, so mounting his fully grown horse Thor on the first morning was a bit new. So we set off and the weather remained dry if a little cold. We rode for about 40 minutes before stopping at a neighbours yurt. There was lots of locals and the cutomary spread was laid out in the middle of the floor. Chai and Kumis were shared. This first spread is then taken away, a basin of warm water is passed around the circle to wash our hands, and a mutton meat course of Beshbarmak is served up – noodles topped with boiled meat accompanied by a bowl of broth. It’s all eaten with the fingers. After eating a lot we’re invited to another yurt up the hill where a very similar spread is laid out again! By the time we leave to get back on our horses we’re both feeling very full. As we mount up the rain starts to fall. We keep going towards the hills, eager to get back to the riding and convinced it will just be a passing shower. An hour later it’s beating down still and after 90 minutes the storm turns into hail and snow. Our Goretex jackets are keeping us dry but our bottom half is sodden and we both have to admit defeat and decide to turn back to take refuge in another yurt. 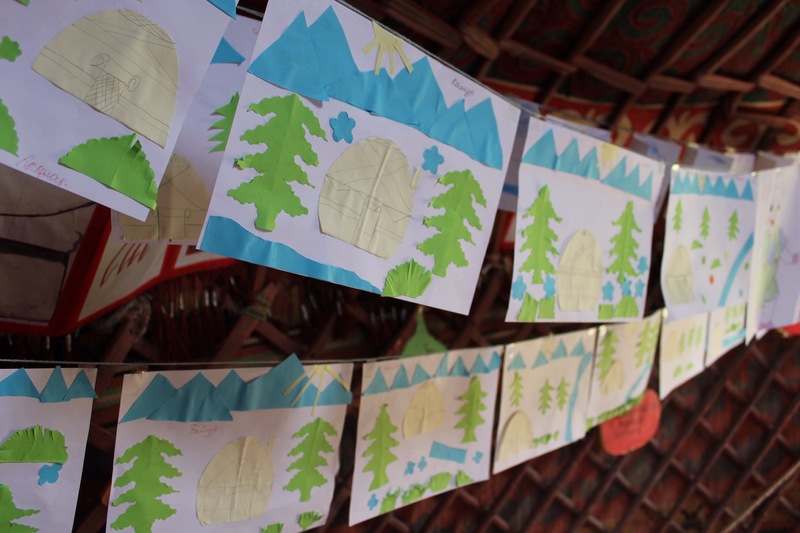 We shelter in the yurt for a while waiting out the rain – finally blue skies brake out. 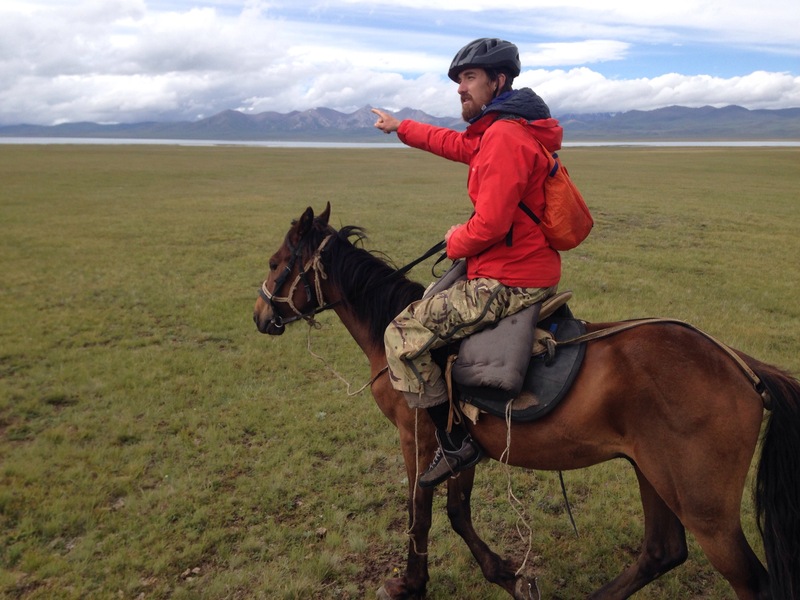 Our guide Aitbek encourages us to both drink half a mug of vodka schnapps before getting back up on the horses. We were all still very wet and we could see more bad weather rolling in across the lake. 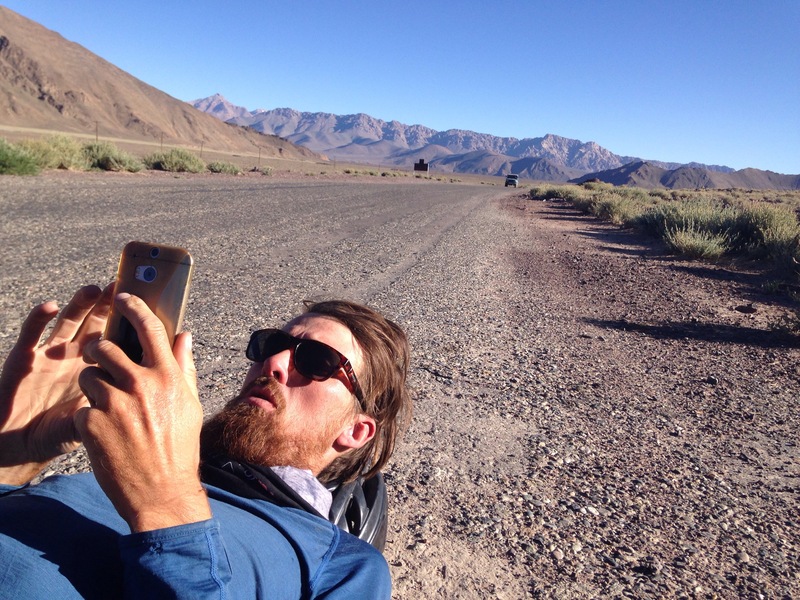 We decide its best to forgo the wild camping in the hills and instead return to the camp where we could dry off, sleep, and set off for another days ride the next morning. Our guide Aitbek seems relieved at this decision and so we all head back to the yurt. 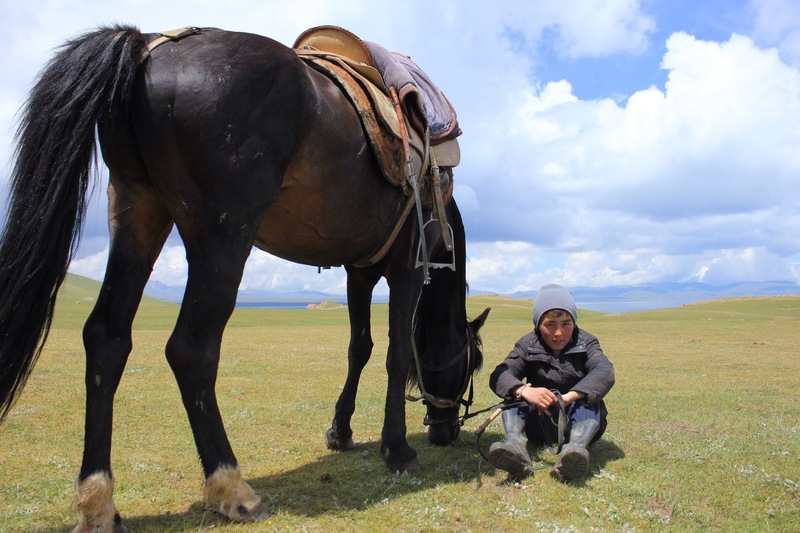 Aitbek plods along on his docile horse but Paddy and I – no doubt fuelled by the vodka – are keen to get our horses cantering. Aitbek doesn’t seem to mind so we both dig in our heels and we’re off. Its great fun cantering off over the fields together and I’m very impressed with Paddy’s riding skills! We race each other for a while and then turn to complete a big loop back to Aitbek. As we near the yurts, the horses obviously recognise their home pastures and get very excited. Paddy is now addicted to cantering so he spurs his horse – who needs little encouragement – onwards. 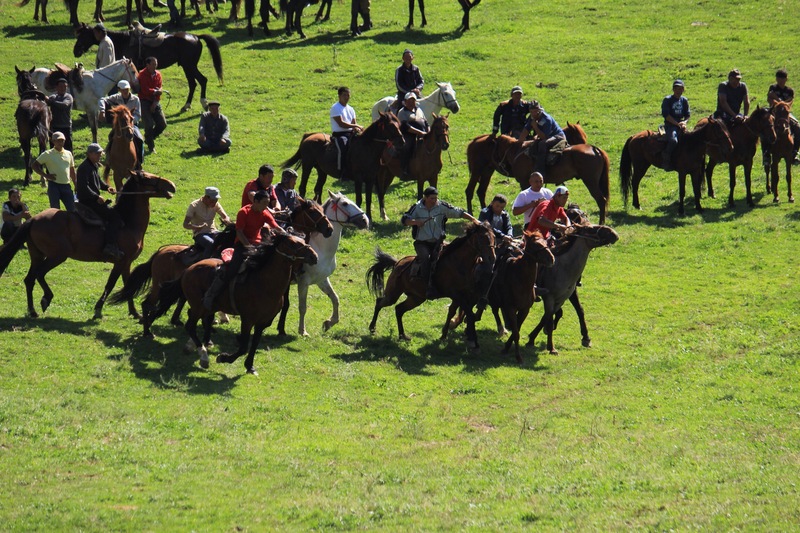 We all watch as he races towards a large ditch… He manages to stop the horse but at the last moment loses his balance and we see him slide off the saddle. Unfortunately Paddy’s foot gets caught in the stirrup and while he’s trying to free his leg Thor gives him a hefty kick in the knee. I watch him hobble back to the yurt and I fetch him some ibuprofen and a very cold bottle of water to act as an ice pack.